UPDATE: Since posting the review we’ve been advised by Kinefinity that the camera supplied was a pre-production/demo unit and (in their opinion) the production model of the MAVO should not exhibit the reliability issues mentioned in the review below. Newsshooter is all about transparency, so that you as a potential user of any equipment we cover can be as informed as possible when making a decision, be it for purchase, hire or use on a job. 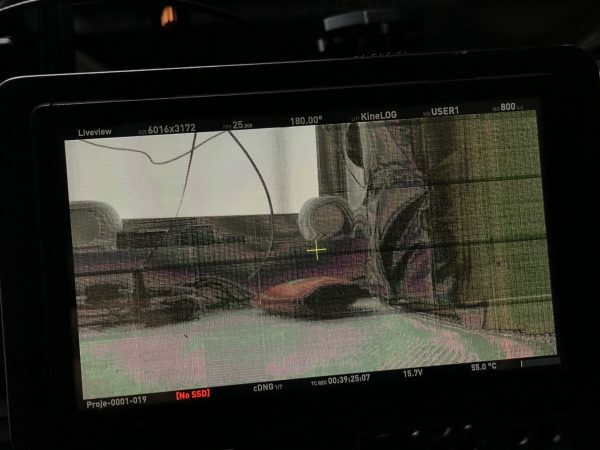 In that spirit we have published an official response from Kinefinity CEO Jihua Zheng at the bottom of the article which addresses some of our concerns about the camera. But we also stand by the observations and conclusions in this review, as they are based on Matt’s evaluation of the camera that was supplied for the purpose of evaluation and review. Prior to the review being published Matt was unaware that the camera wasn’t representative of the final production model. At no time was it mentioned in over 2 months of correspondence that this camera wasn’t a production version. 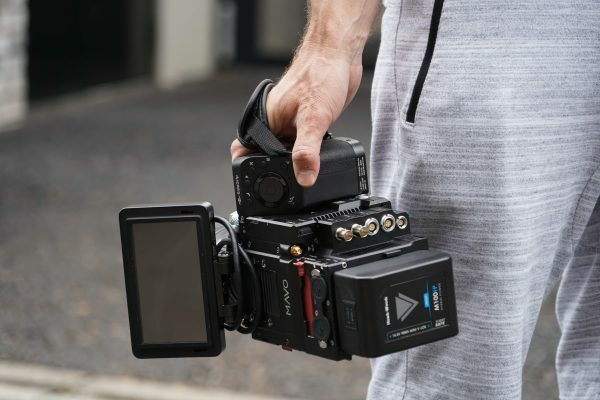 Kinefinity has confirmed that it will supply a production version of the MAVO LF for review shortly, and—as with this review—Matt will give his honest observations about all aspects of the camera, including its reliability. 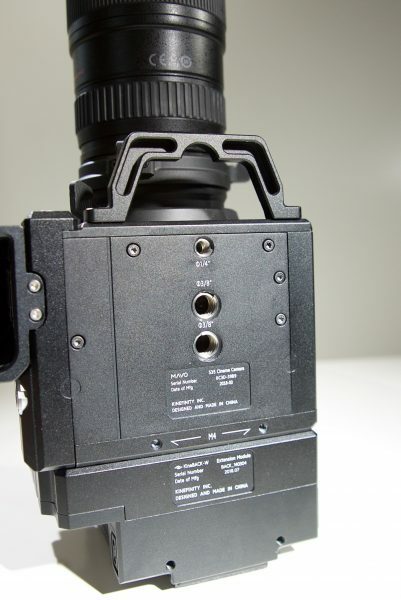 Kinefinity has a rather niche place in the digital cinema camera space. They are a small company who aren’t afraid to compete with the big boys. I actually shot with their first ever prototype camera, the KineRAW S35 way back in 2012. 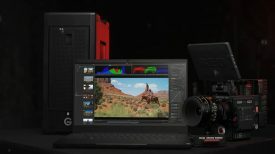 Kinefinity has come a long way in the last 6 years and in that time they have since released numerous cameras that have gradually started to win cinematographers over. 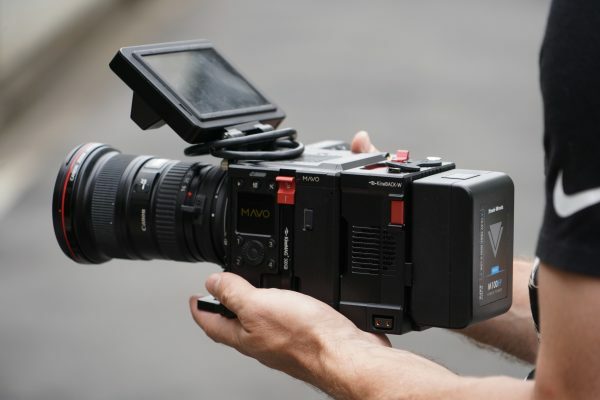 No longer are they thought of as “That Chinese camera”, but rather, a legitimate alternative to cameras made by Sony, Canon, RED, Panasonic, and Blackmagic Design. This brings me to their latest offering the MAVO. 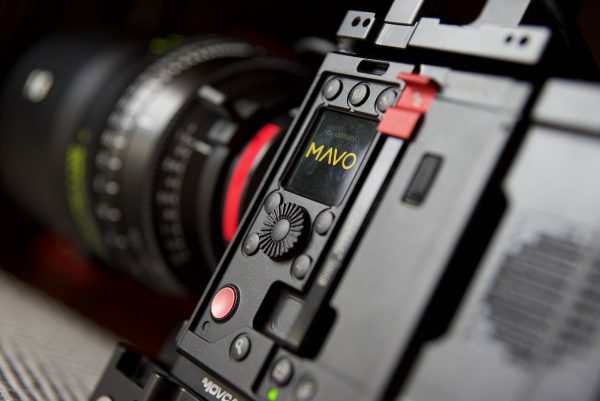 The MAVO is Kinefinity’s current flagship camera and features a 6K (24mm x 16mm) 3:2 S35 CMOS sensor. The camera can shoot in various resolutions from HD (1920 x 1080) all the way up to 6K Open Gate (6016 x 4160). 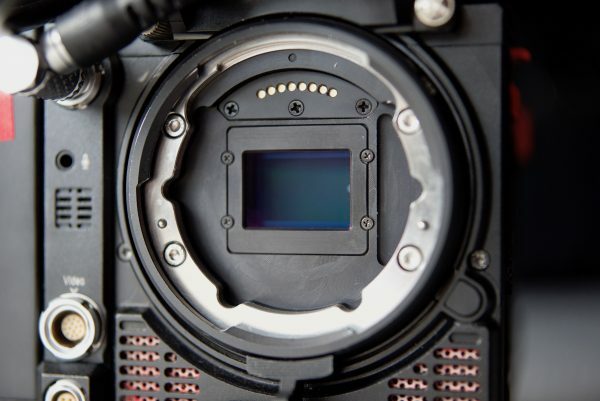 With a 6K 3:2 aspect ratio, in addition to the conventional 16:9 and 17:9 standard aspect ratios, the CMOS sensor can also provide a variety of image formats, such as 4:3, and 6:5 for anamorphic shooting. In addition to the MAVO, Kinefinity also announced the MAVO LF, which features a full-frame 36x24mm sensor and is set to ship later this month. Above you can see how the MAVO and the yet to be released MAVO LF sensors compare to some other cameras on the market. The sensor on the MAVO can also be cropped to shoot in M4/3, S16, and 16mm modes. There is also a multitude of frame rates you can record at depending on what resolution or image format size you are shooting in. In the normal S35 mode, the crop factor of the MAVO is 1.5x which is a lot better than the 1.85x that is found on the TERRA. You can of course also use the KineEnhancer (Kinefinity’s speed booster – $699 USD) and get the full frame “look” when using full frame lenses. Now you do need to be aware of some key issues when choosing these different sensor modes. 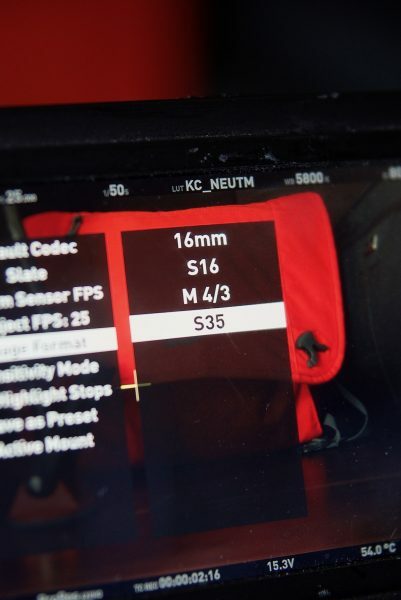 For instance, if you want to shoot in HD (1920×1080) you can only do so in the M4/3, S16, and 16mm modes. You can’t shoot HD in the S35 mode. 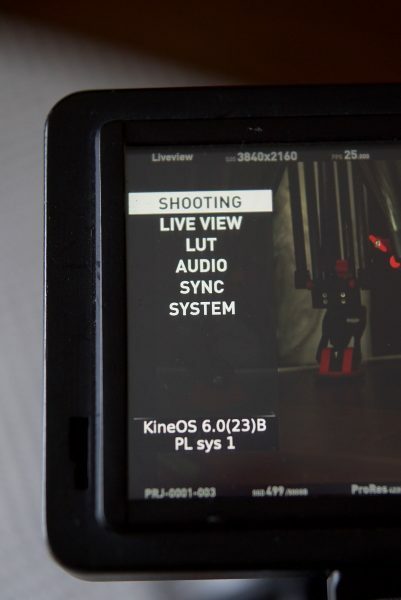 According to the specifications and KineOS 6.0 release, there is an Oversampling mode which uses the full S35 sensor that records to ProRes only but it was not available in the menu. 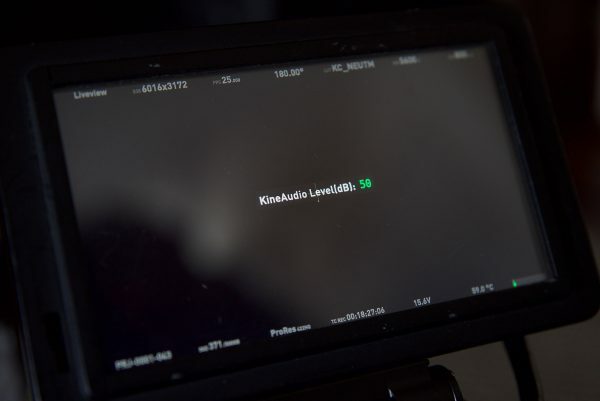 In the S35 mode, the smallest resolution you can shoot at is 2944×1200, this is despite the fact that Kinefinity’s own specifications say you can shoot at up to 2K (1920×1080 at up to 55fps). In the S16 mode, you can shoot at a maximum resolution of 3072×1620. In 16mm mode the highest resolution available is 2048×1080. 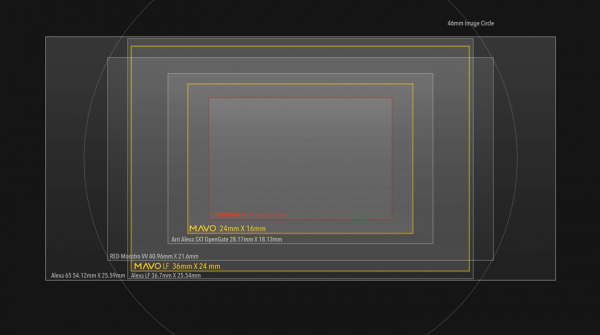 In the video above you can see what the different sensor sizes look like on the MAVO when a 35mm lens is used. 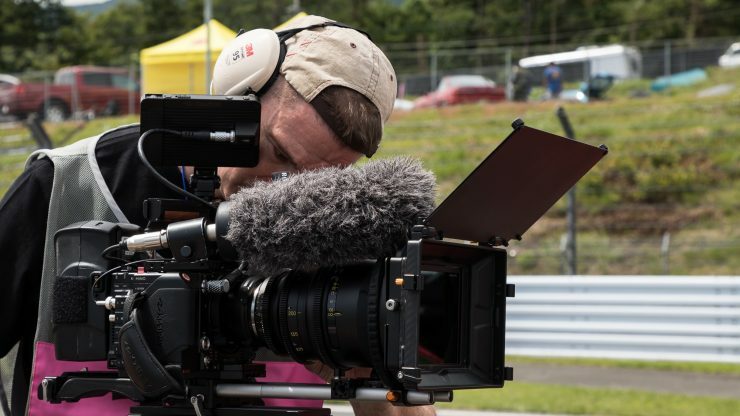 At the top of this review, you can see some example footage I shot with the MAVO at a drag racing event at the Fuji Speedway in Japan. Most of the footage was taken at the cameras native ISO of 800, but quite a lot of the shots in the garage were done at 1600 ISO. I shot at various resolutions and frame rates and captured material in ProRes 422HQ. Shooting in RAW wasn’t a realistic option considering I only had one 500GB KineMAG. Lenses used were the Tokina 18mm T1.5 Cinema Vista, 85mm T1.5 Tokina Cinema Vista, and a TLS Morpheus 80-200mm T2.8. As the camera doesn’t feature built-in ND, I used a Revar Cine Rota-Tray 4×5.65/138mm Variable ND Kit with Circular Polarizer and 4×5.65 Linear Pol MC in a Bright Tangerine Misfit matte box. The drag racing environment proved to be a nice testing ground for the camera, as it provided some challenging dynamic range conditions. If you want to see some more vision from the camera, it will be in the upcoming Laowa 24mm f/14 2x Macro Probe lens review that will be on the site in the next week or so. Who is the MAVO aimed at? This is a hard question to answer. 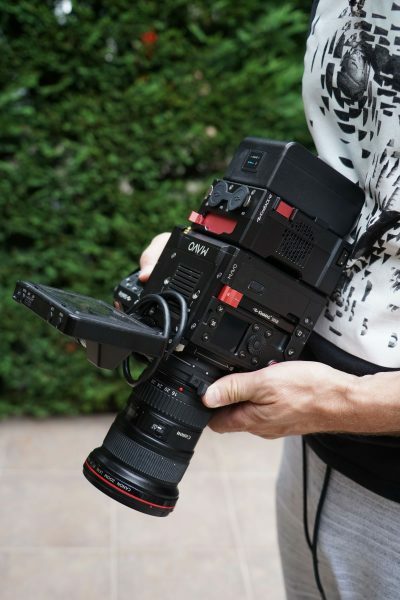 Realistically, the MAVO could be used for a wide variety of applications, but it’s certainly more suited to Indie filmmakers and those creating their own content. 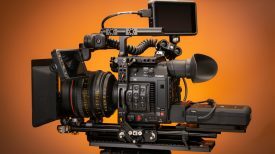 It’s probably best to think of it as a low-cost alternative to a RED, but also a direct competitor to say a Blackmagic Design URSA Mini Pro, Canon C300 Mark II, Canon C200, Sony FS7, and Panasonic EVA-1. 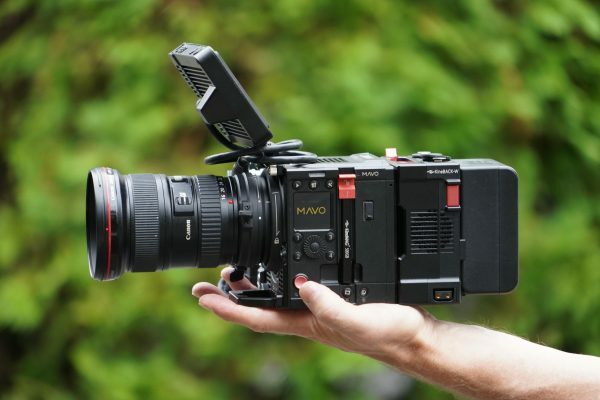 If you are shooting events, documentaries or news, then the MAVO probably isn’t the right camera for you. That’s not to say it couldn’t be used for these applications, but in my opinion, there are cameras better suited to that type of work. 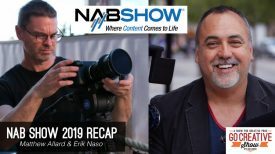 As I said earlier, if you are an Indie filmmaker, or create your own content then the MAVO makes for a compelling option to other cameras that are available at this price point. With a host of recording options, shooting resolutions, lens mounts, and accessories available it certainly offers good value for money if you are an owner/operator. For me personally, the dynamic range is one of the criteria I look at closely when choosing a camera. I’m not so concerned about high numbers of dynamic range, but more interested in where those stops are allocated and how the highlights roll off. There is a big difference between the usable dynamic range and actual dynamic range. 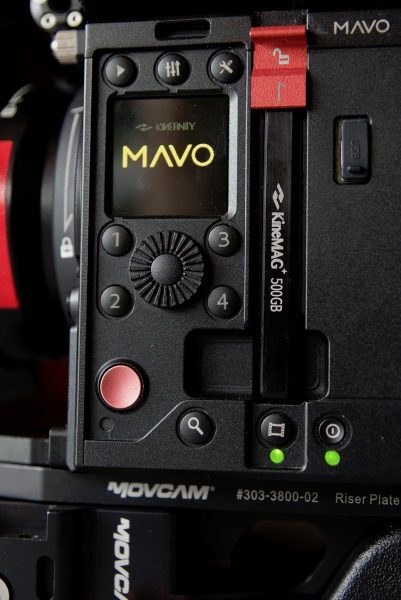 Kinefinity claims that the MAVO has more than 14 stops of dynamic range. I wasn’t interested in shooting charts in controlled environments to work out what the actual dynamic range was, as that only tells you part of the story. I wanted to see how it actually performed in real-world scenarios. 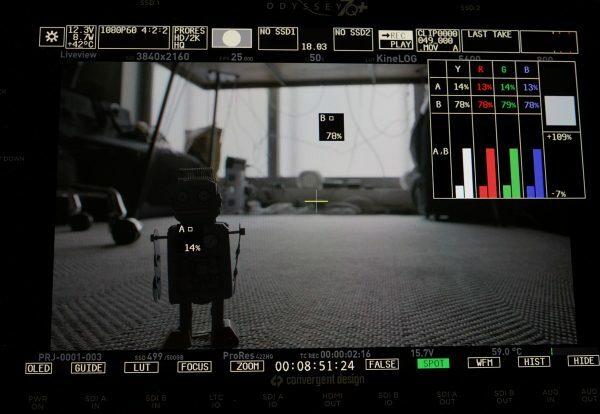 To see how the sensor behaves I put it head-to-head against ARRI’s ALEV III sensor. This sensor also has a claimed 14 stops of dynamic range, and in my opinion, is still the benchmark for which others sensors should be compared to. I set up a simple test with an object in the foreground and there was a gradual increase in brightness falling away to a window. The whole point of this test was to see where the IRE values would fall between the two cameras if you used them at their base ISO values (both are rated at 800), with the exact same white balance, shutter angle and exact same lens and T stop. In this case, the white balance was set at 5600K for both cameras and the lens being used was a Tokina 18mm T1.5 Cinema Vista and the T stop was set at T1.5. The MAVO was set in ISO mode and the Highlight Stops was set at 4.6. Both cameras were outputting an unprocessed Log image over SDI to a Convergent Design Odyssey 7Q+. The MAVO was set to output KineLOG and the ARRI Amira was outputting ARRI LogC. Above you can see the IRE values I got from the MAVO. The value on the robot was 33% and the value on the window was 81%. So now that we have seen the IRE comparison, let’s look at how that information looks with false color. Above you can see the results for the MAVO. Above is the false color reference image for the ARRI. Now let’s see what these look like on a waveform. Above is the MAVO. Above is the waveform for the ARRI. 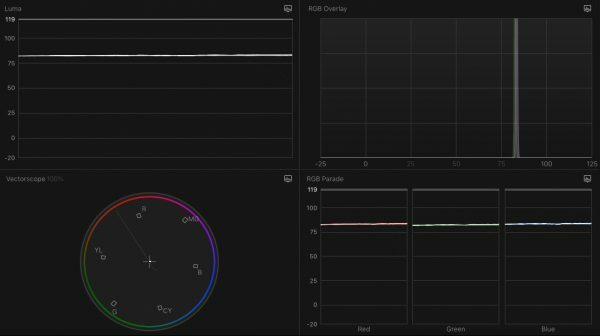 With the ARRI LogC image being a lot brighter at 800 ISO, what ISO did I have to set the MAVO at to achieve similar IRE readings? In somewhat of a shock, I had to raise the ISO on the MAVO to 2560 ISO to achieve the same IRE readings I was getting at 800 ISO on the ARRI. In another test, I wanted to stop the lens down on the camera to a point where I could see the cables hanging in front of the window. Above you can see that for the MAVO to be able to see the cables the IRE value on the robot went down to 14% and the window to 78%. Above you can see what IRE values were needed to achieve the same result on the ARRI. As you can see the ARRI could see the cables with the IRE value all the way up 91% while still maintaining more information in the mids and the shadows. 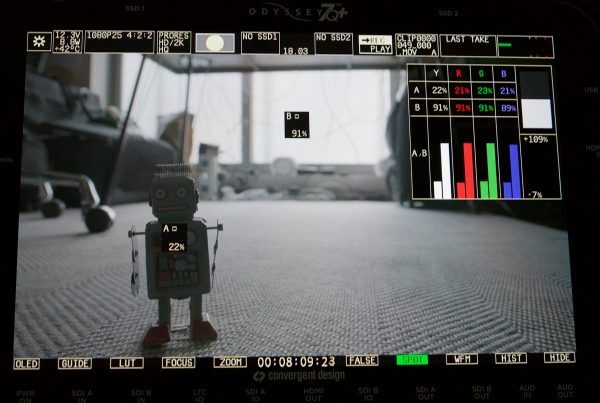 The ARRI sensor is phenomenally good at maintaining highlight detail. The MAVO does have the ability when used in the ISO mode to change how many stops are allocated to the highlights. I decided to test this and set the camera at 6.6 stops to see what happened. Above you can see that at 800 ISO with the Highlight Stops set to 6.6, the value on the robot dropped down from 33% to just 9% IRE and the window got reduced from 82% (with the highlight stop set at 4.6) to 78%. While the camera was able to get a bit more protection in the highlights, the mids and shadows dropped off quite dramatically. The differences in IRE readings could be due to overly optimistic ISO ratings for the MAVO but could equally be more to do with the differences in the LOG curves. Above you can see what the KineKC_NEUTM LUT looks like on a waveform. Below you can see how it compares to a standard ARRI REC.709 LUT. As far as codecs go, the MAVO can record compressed RAW using Kinefinity’s KineRAW (KRW2.0) format. It has compression ratios ranging from 2:1~10:1. KineRAW is actually a fairly efficient RAW codec. 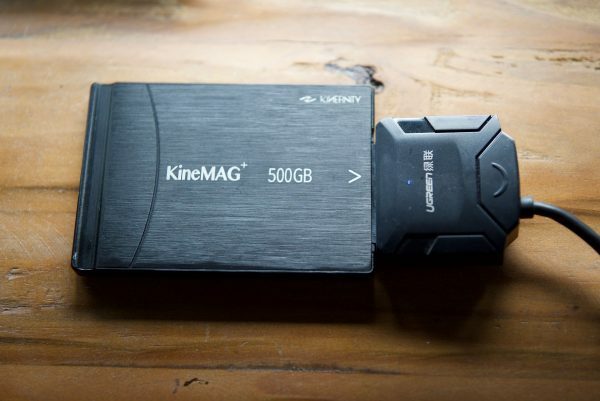 If you were to shoot at a compression ratio of 3:1, one 500GB KineMAG SSD can record around 100 minutes of 4K RAW data. The data rate of KineRAW (3:1) is only slightly larger than ProRes 422HQ. If you are working with Davinci Resolve, the MAVO can record cinema DNG where the compression ratio can be set to 3:1, 5:1, or 7:1. If you prefer you can also shoot directly to ProRes 444XQ/444/422HQ/422/LT/Proxy. Having all these options is very impressive for a camera at this price point. 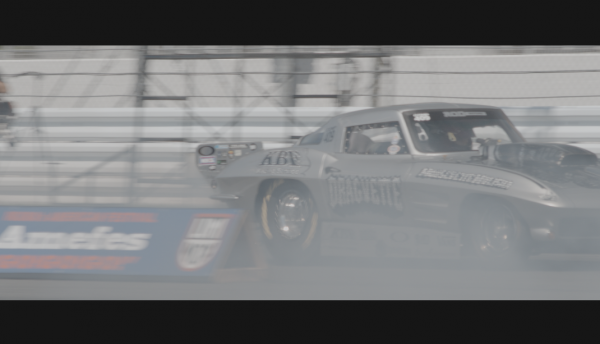 Kinefinity really has done a good job at offering users a range of recording options. Not everyone wants to record in RAW, and having the ability to record in a range of compressed ProRes codecs is extremely handy. 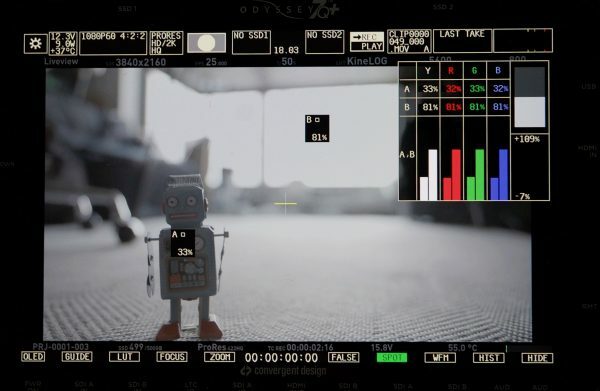 So how do these codec options compare to Kinefinity’s other camera, the TERRA? Well the TERRA could only record in KineRAW (KRW2.0) as compressed RAW with compression ratios ranging from 2:1~10:1, and in ProRes 422HQ. The problem I found is that KineRAW is not yet implemented in the MAVO and it doesn’t appear in the list of codecs. KineRAW (KRW2.0) is scheduled to be released sometime towards the end of the year. The MAVO has the ability to insert a wireless card using Movcam’s DarkTower platform, into the new KineBACK-W, this gives the MAVO wireless camera functionality including wireless video transmission and wireless lens control system using Movcam’s lens motors. The wireless video can work at up to 2000ft/3000ft depending on which DarkTower card is used. I tried out a pre-production version of Movcam’s DarkTower and it worked really well. It was nice that you could just drop the DarkTower module into the back of the KineBACK-W and you don’t need to power it or hook up any additional cables. The MAVO also had a dedicated menu for DarkTower where you can turn it on/off and make channel selections etc. The MAVO uses standard 2.5″ 7mm SSD SATA 3.0 recording media. There are many off-the-shelf 7mm SSD drives available, however, the performance of 3rd party SSD drives is not guaranteed by Kinefinity. 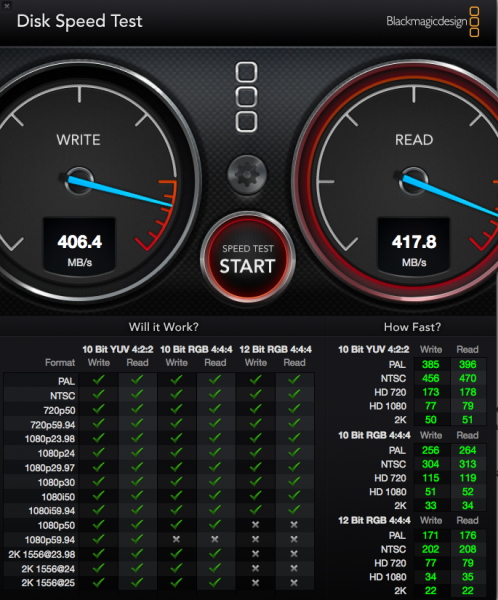 Kinefinity offers no technical support or help on recording issues such as frame drop or data loss for 3rd-party SSDs. Kinefinity does make their own 7mm KineMAG+ SSD which are available in 500GB & 1TB variants, retailing at $699 & $999 USD. You do need to make sure that the SSD is deactivated before you take it out of the camera. You have to go into the SSD Maintenance menu to do this. This is something that is easy to forget to do and I’m not a fan of this process. The whole activating and deactivating and rebuilding the SSD menu is not that user-friendly. It’s far too easy to accidentally make a mistake. 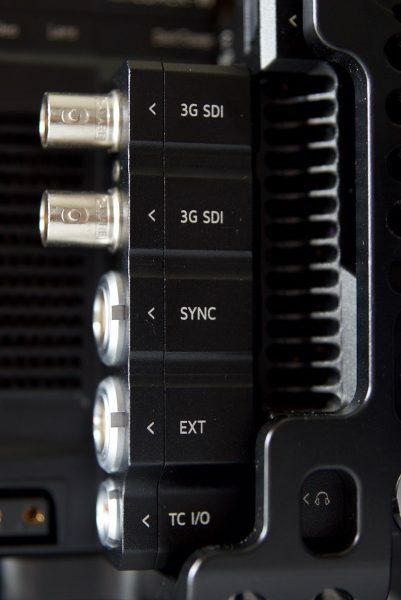 Above you can see the read and write speed of the KineMAG+ 500GB SSD when using Kinefinity’s USB3 SSD reader. The MAVO allows you to upload a LUT to the camera. 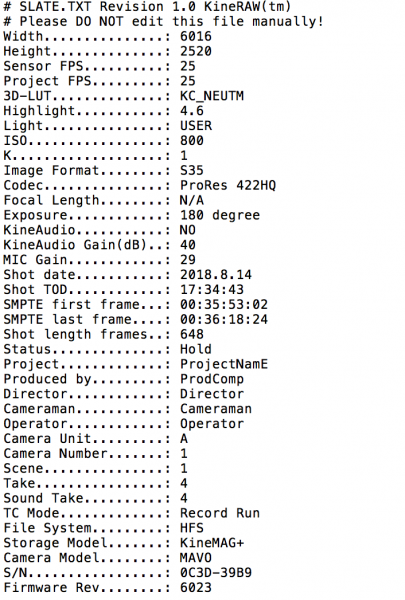 The LUT does not get burnt into the footage, the footage is always recorded in a Log image (KineLOG3). Whatever LUT you are using at the time of recording gets saved to the same folder. This is a really nice feature because the editor or whoever is dealing with the footage knows exactly what LUT you were using and therefore has an idea of how the cinematographer intended the footage to look. The size of 3D LUT is from 8x8x8 up to 33x33x33. Currently, there is only one LUT in the camera, the KC_NEUTM.cube. As there is only one LUT available in the camera I had Ben Allan ACS CSI create a LUT that doesn’t so aggressively crush the blacks and mid tones. I found this LUT was a lot nicer to use than Kinefinity’s own LUT. 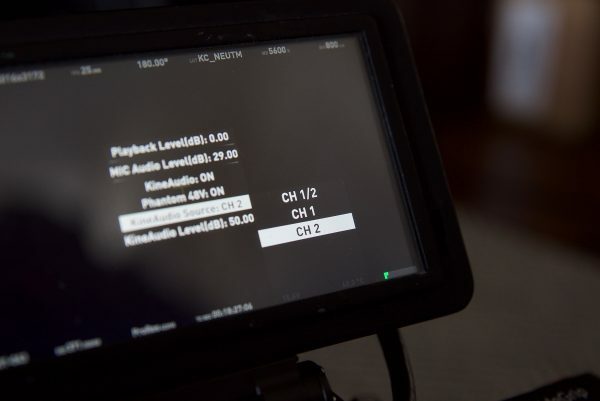 Along with all the information such as the LUT you were using that gets recorded with your clips, Kinefinity also gives you the option to fill out a full slate with all of your shooting details and information. This can be done in the menu, but I will warn you, it is a fiddly system to use and it takes considerable time to fill out. Hopefully, as part of the future camera control, you will be able to get a 1st AC or an assistant to fill out the slate details remotely. The MAVO & MAVO LF have built-in Wi-Fi but as of yet, there is no iOS or Android app to control the camera or adjust settings remotely. The KineMOUNT is the native lens mount that came with the TERRA. The MAVO, however, gets a new KineMOUNT that has been re-designed with an electronic contact (active) in order to support a new PL mounting adapter with /i tech and new cordless EF mounting adapter, EF mounting adapter with KineEnhancer, Nikon F mounting adapter, new SONY FE/E mounting adapter, and EF/PL mounting adapters with electronic ND(e-ND). It is one of the only other cameras that has a Sony E-mount option, making it compatible with the Fujinon MK lenses. If you use the Canon EF mount, the iris can be adjusted using the control wheel or the wheel on the SideGrip. The iris will adjust in 1/3 stop increments. Now the problem with using an EF lens on the MAVO is the iris transition is not smooth and the brightness level jumps when you make changes. Changing aperture during recording means your shot will be unusable. If you try and change apertures very quickly you just end up with this massive delay while you wait for the lens to catch up with what you are doing. Above you can see a short test showing how the aperture works when using a Canon EF lens. Now according to Kinefinity there is a mode called “Enhanced Mode” that is claimed to get rid of this transition. Apparently, you can only get to this mode by resetting the camera to its default settings. 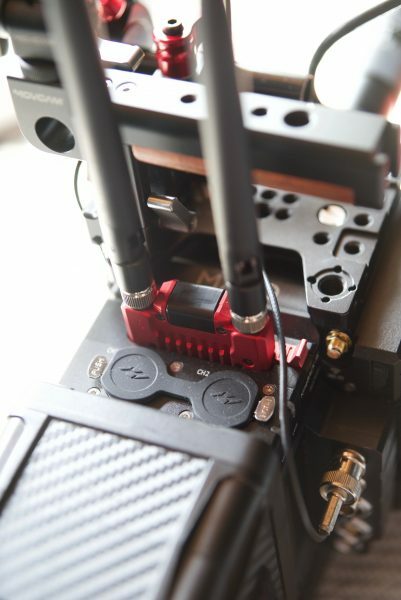 If you are using mounts with electronic connection pins, Kinefinity strongly recommends that you power off the camera when swapping different adapters to avoid damage to the camera. I really like the KineMOUNT as it makes the MAVO incredibly versatile and allows you to use a huge range of glass depending on your needs and budget. The ability to use tiny Nikon or Canon lenses or switch up to huge cinema zooms is a nice feature that shouldn’t be overlooked. The MAVO really is tiny. At 2.1 lb (990 g) and with dimensions of 4.5″ x 4.3″ x 3.7″ (115mm x 110mm x 95 mm) for the body alone, it can literally fit in the palm of your hand. It really is impressive that Kinefinity has been able to fit so many features in such a small camera body. Of course, just like a RED, you can’t use the body just by itself, you need to build it up with a bunch of parts to make it useable. The other positive aspect of the camera being so light is it’s easy to switch it from a tripod to a gimbal or even a drone (but you will need a large drone). This flexibility is what a lot of shooters are looking for in a camera, and it’s why we are now seeing so many cameras coming to market that have been designed with this in mind. I personally think one of the biggest drawcards of the MAVO is the compact size and form factor. What you do need to keep in mind is that the MAVO is much like a RED where you need to add accessories to turn it into a workable camera for most applications. By the time you add a lens, battery, KineBack-W, SideGrip and monitor or EVF, the size and weight of the camera can massively increase. As an example, above I have the MAVO with the KineBack-W, SideGrip, Movcam top plate, handle, baseplate, a Zacuto Gratical and mount, an Anton Bauer 150Wh CINE battery, and a Canon 16-35mm F2.8 lens. This combination weighs in at 6.7kg (14.77lb). The MAVO’s form factor is very reminiscent of a RED. Like a lot of other cameras, it is basically a box with buttons on it. As I mentioned earlier, it’s incredibly lightweight, but surprisingly it feels very solid and well made. It doesn’t have the plastic feel of some offerings from Sony, Panasonic, and Canon. The build quality isn’t quite as good as a RED, but it’s not too far off. The quality of the buttons and dials are ok, but again they aren’t as solid and as tactile as on a RED. If you try and move the scroll wheel too quickly, the system can’t keep up and there is a massive delay. 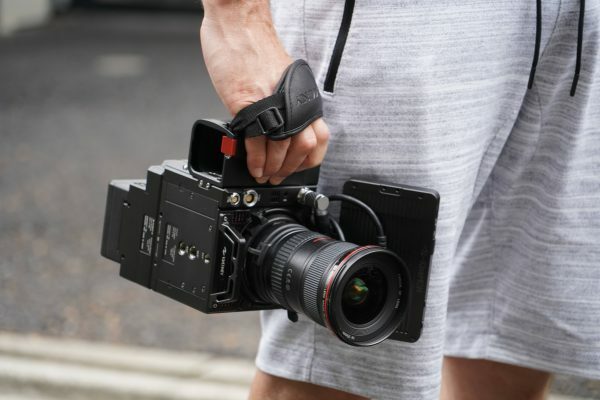 The MAVO, like so many of today’s cameras, is just a box that needs other accessories if you plan on shoulder mounting it or making it more usable. I have a love-hate relationship with this type of form factor. On one hand it’s great to be able to break a camera down and use it in a very minimalistic way, but on the other hand, I don’t like having to put a ton of things on a camera to make it usable for most shooting scenarios. Everyone’s shooting style is different, but I like to be able to put a camera on my shoulder and use an EVF. 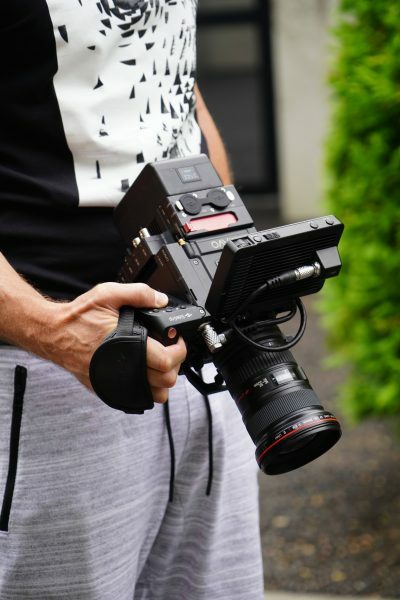 Unfortunately just like a lot of other modern day cameras, if you want to do this with the MAVO, you need to add some sort of shoulder support system and EVF. The trouble is, once you do add a shoulder mount to the MAVO, you can’t easily get to the menu or camera controls. As the SideGrip can’t be relocated, it becomes virtually useless in a shoulder configuration. 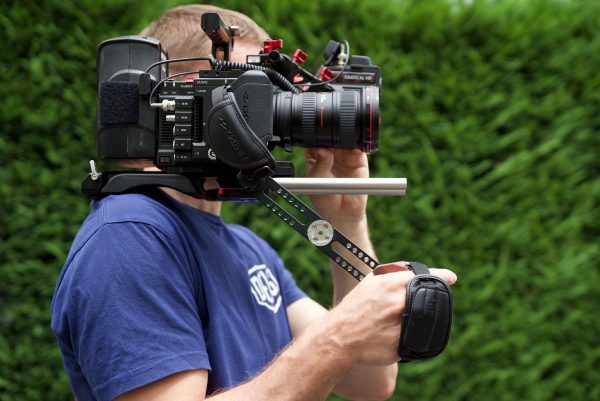 These are things you need to keep in mind if you plan on using the camera with a shoulder rig. The other problem when using really small cameras like the MAVO is it’s very easy to quickly run out of room to mount accessories such as wireless video transmitters, an assistants monitor, remote FIZ control units and anything else you may need. On the bottom of the camera, there are three mounting holes. Two 3/8″ and one 1/4-20″. 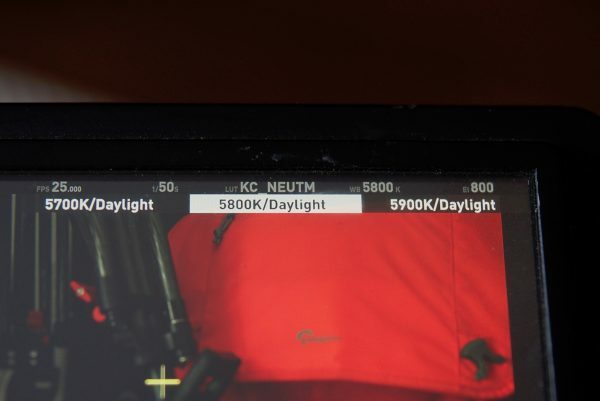 The KineMON-5L 5″ Full-HD Monitor is the same monitor that is used on the TERRA. It features a 1920×1080 physical resolution, 1000:1 contrast ratio, full viewing angle, 500nits brightness and LED bias light. Kinefinity claims it can display 16 million colors (RGB 24-bit depth). 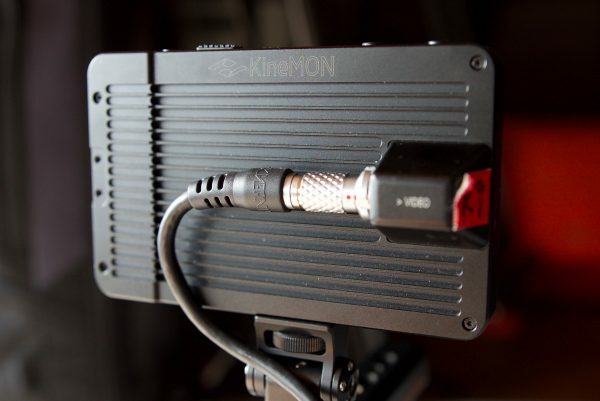 A single Kine Video Cord supplies both the power and the video signal from the MAVO. The nice thing about this is that the monitor comes on when the camera is powered up and it turns off when the camera gets turned off. 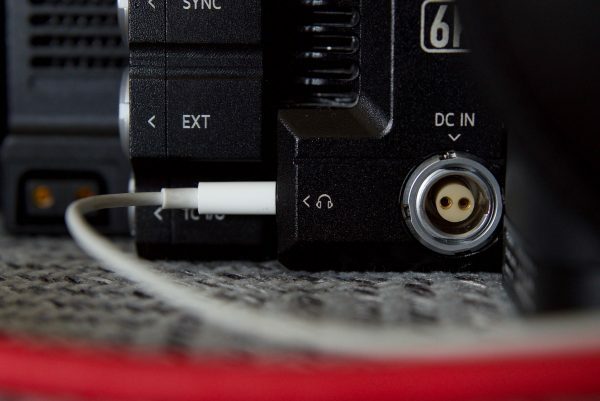 The cable that goes between the camera and the monitor to send the power and video signals uses a 14-pin MOCO connector. This is a nice and robust connector that uses a push-pull type locking mechanism. 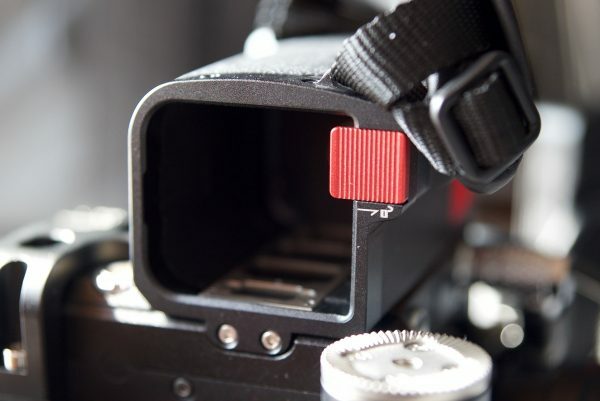 TERRA EVF Mount for Shoulder Pack: The TERRA EVF Mount has pins designed for pinholes of KineMON so that the monitor can be fastened on the EVF Mount. The KineMON-5L weighs 260g and the casing is made of metal for better heat dissipation and in theory, this should also make it more durable than other plastic monitors. There is also an optional 5-inch KineMON sun hood for shooting in bright condition. 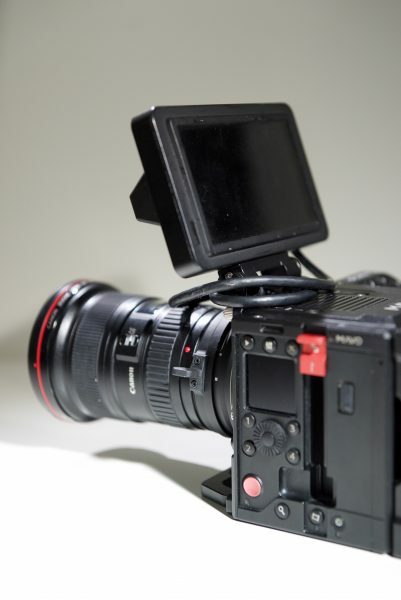 As far as what the KineMON-5L can do, it has dedicated buttons for Focus Peaking, False Color, Clip Guide, Backlight adjustment and a power switch. The Focus Peaking mode turns your image into black and white and you get a red outline of what is in focus. I couldn’t find any way of changing the focus peaking strength, color of the peaking, or keeping the image in color instead of it turning black and white. 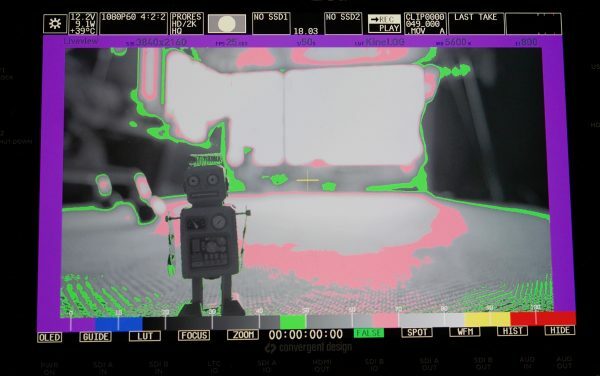 The false color scale is shown in the reverse way of most digital cinema cameras. The MAVO’s scale goes from 101 to -1 IRE. In reality, I didn’t find that the KineMON-5L was very useable. It’s not that there is anything wrong with the image, it’s just that it isn’t bright enough to use outdoors. Why camera manufacturers or third-party monitor manufacturers (there are some exceptions) keep making screens that you can’t see in daylight conditions and insist on calling them daylight viewable is beyond me. How you are supposed to judge focus on a screen you can’t see when shooting in 5K or 6K resolutions is a mystery to me. At the end of the day, everything you are capturing with a camera is being determined by what you are seeing through a monitor or EVF. Using one that you can’t see makes absolutely no sense. The KineMON-5L also gets ridiculously hot even after it has been used for just 15 minutes. The back of the monitor almost burns your hand if you touch it. Whatever the design is they are using, it doesn’t feel like the monitor is being adequately cooled. If that wasn’t enough in the way of problems I also found that there seems to be a definite delay in the signal path. If I move something in front of the camera I don’t see that image move until slightly after. It’s not like it’s a second off or anything but there is at least a 50-100 millisecond delay. Above you can see a short video showing just how bad the delay is when using the KineMON. This delay doesn’t happen when using an external monitor or EVF through SDI. I also had problems occasionally when the KineMON was turned on and it came up with a screen that looked like it was experiencing some sort of communications problem. One thing that is missing is an EVF. Kinefinity doesn’t make an EVF for any of their cameras and if you want to use one you need to look at a third party solution. I still think you need a dedicated viewfinder on any camera because using an LCD screen outdoors is just not entirely practical. Between glare, direct sunlight and not being able to see the screen correctly because it is either too close or too far away from you, there is a myriad of problems it can create. Unfortunately, as I just mentioned, I found that the KineMON-5L 5″ Full-HD Monitor isn’t nearly bright enough to use outdoors. In my personal opinion, if you are going to shoot 4K, 5K or 6K resolutions you really need a good quality EVF. Trying to rely on small monitors to gauge your focus is far from ideal. I found the only way to accurately judge focus when using the camera was through the use of a third-party EVF, in this case, a Zacuto Gratical. As with any camera accessory you use, you need to think about where you can mount it and how you can power it. One of the problems you certainly need to be aware of is that the MAVO doesn’t seem to send any timecode or audio over the SDI when using the KineBack-W. 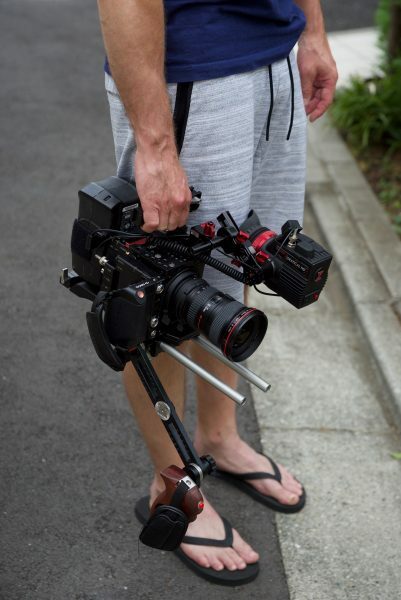 I tried this with the Zacuto Gratical, Convergent Design Odyssey 7Q+, and a smallHD monitor and it didn’t make any difference. When I tried hooking the MAVO up to an Atomos Shogun Inferno using SDI, I wasn’t able to see any picture at all. 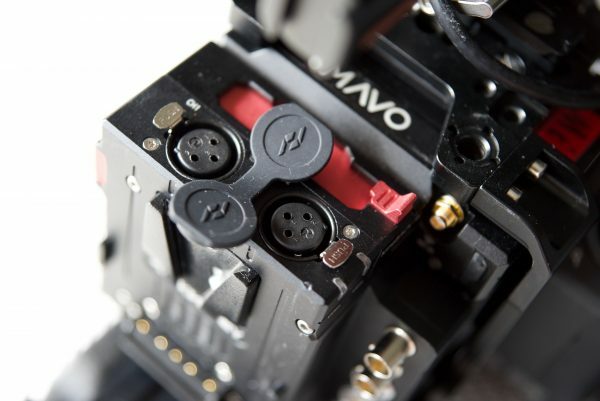 The Atomos couldn’t take the output coming from the MAVO. There also doesn’t seem to be any way of sending a clean output over SDI. The MAVO’s on-screen menus are always enabled over SDI. Despite having two SDI outputs the MAVO has no way of letting you assign what goes out over those outputs. You can’t for instance, send a clean feed over one SDI, and a LUT over the other. This lack of customization doesn’t make the camera very friendly for larger productions. As far as the HDMI out goes, I couldn’t get it to work at all. Again I tried hooking up the Convergent Design, Zacuto, smallHD, and the Atomos and nothing worked. I have a feeling that the HDMI is only powered through the SideGrip, and if that isn’t powered on, maybe the HDMI output doesn’t work. If this is the case, then it is a major design flaw. 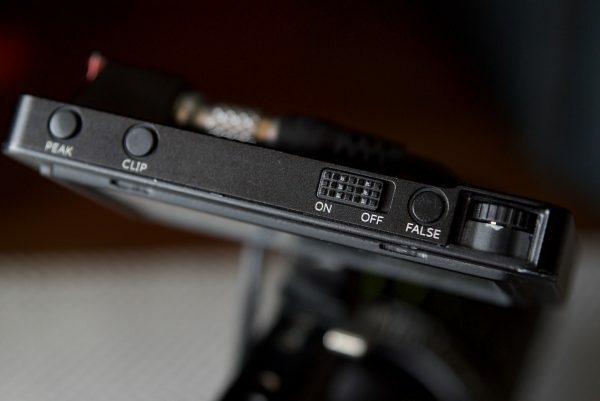 Other Kinefinity users have said that their cameras HDMI out worked even when no battery was in the KineGrip. I am so glad the company moved away from the complicated multi dial operating system they were using on the Kinefinity Terra. That was just downright confusing and not easy to use. I’m a stickler for wanting to use cameras that are easy to control and operate. There is nothing worse on a camera than confusing menus and badly labeled or placed buttons and switches. So how does the MAVO fair? Well, in all honesty, it’s definitely an improvement over previous cameras, but there are still many things that could be done better. A well-designed camera, in my opinion, is one that you can turn on and get up and running within 5 minutes of using it for the first time. The MAVO doesn’t have many physical buttons on the body of the camera, but some of the ones that are there are badly labeled. A menu button should be clearly labeled MENU, but Kinefinity prefers to label it using a vague icon. The first time I turned on the camera I had to initialize the SSD, so naturally, I accessed the menu and looked for a format/initialize media section. I couldn’t find one and as there is currently no instruction manual for the MAVO I had to look at the manual for the TERRA to find out how to do it (why a production camera that is shipping doesn’t have an instruction manual is beyond me). Again there is a button underneath the SDD media slot that isn’t labeled and has an icon that looks like a film strip. You have to press this button to access the SSD media options menu. Now I may be sounding very picky about these little details, but potential buyers of this camera need to be aware of these type of quirks. I also had a few instances when I turned on the camera and nothing would come up on the monitor. I then wasn’t able to turn it off without physically removing the battery from the camera. I also had several instances where the image was just frozen on the screen, or just a screen saver appeared on the KineMon monitor. 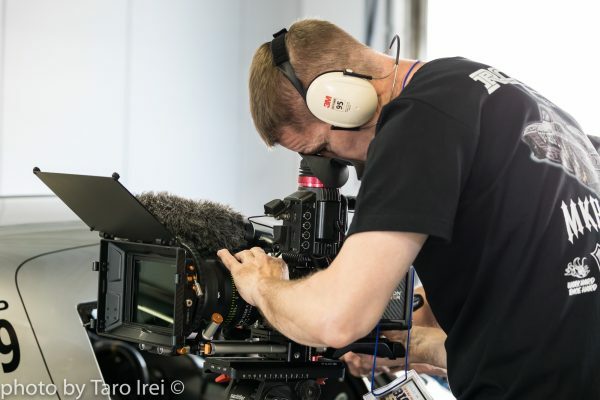 When I was actually out shooting with the camera at Fuji Speedway I had at least five instances of the camera “shitting itself” for lack of a better term. What was alarming, is that on a few occasions the camera froze up during the middle of the recording. The record tally light was still on, but the picture was frozen. I had to do a hard reboot by holding the power button down for around 20 seconds to fix it. Each time this happened the file got corrupted and was unable to read it on my computer regardless of what program I used. These sort of problems are something I wouldn’t be happy seeing from any camera, let alone one that costs $7,500 USD. The absolute golden rule with any professional product is it has to work and be reliable 100% of the time. The menu system certainly is a lot less complicated than some of the offerings from Sony and Panasonic. Like any camera, the more I used it, the more comfortable I got with the controls and menu. There is a small LCD screen on the side of the camera body that I assumed was going to show me key information about the camera and let me make changes to things like ISO, frame rate, shutter angle etc. but it doesn’t show anything other than a MAVO logo. Perhaps it will be implemented in a future firmware update. Making changes in the menu is pretty straightforward, but again if you could just do it on the side of the camera for key parameters it would be so much better. Some of the ways you make changes to certain aspects of the operation of the camera are a little confusing. Some things can be changed in the menu and other things need to be changed using the function buttons on the side of the camera. While I am a fan of being able to change things without having to go into a menu, there are certain things, for example, if you want to change the resolution you are shooting in, that can’t be done in the main menu. Changing key parameters using the scroll wheel and buttons when not going directly into the menu is not very responsive and if you try and make changes too quickly the system bogs down and takes time to catch up. This is not ideal when you are trying to change settings such as frame rates or ISO in a hurry. The MAVO uses Sony BP-U style batteries, but you can’t use any of the normal Sony version. I was originally told that the MAVO needs Kinefinity’s own BP-U style batteries (45 Wh) called the GripBAT. These batteries fit into the side grip and this is the easiest way to keep the camera small and compact. If you want longer run times then you can use the optional KineBACK-W and attach a V-mount battery. Since doing the review I’ve now been made aware that you can use regular BP-U style batteries in the handgrip. The great thing about the MAVO is that it draws just 21 W. This is very low and allows for long run times on small batteries. If you use a larger V-mount battery, like a Hawkwoods 150Wh mini V-lok you can go pretty much all day on a single battery. What you do need to remember is that the 21 W power draw doesn’t take into account the use of the KineBack-W, an EVF or monitor, or running any +48 audio devices. The MAVO certainly doesn’t get up and running quickly. It takes around 25 seconds from the time you power it on until you get a picture up and can start to record. 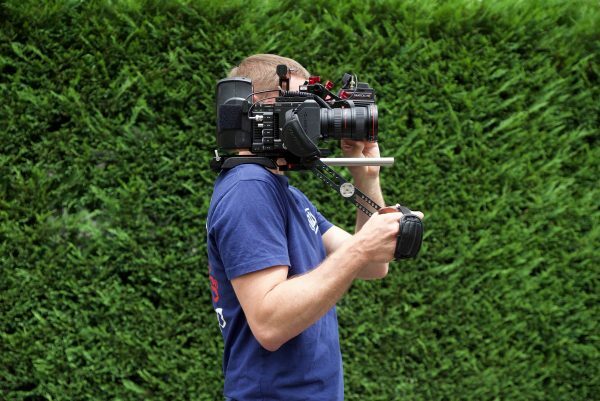 This doesn’t really make the camera suitable for event, news or documentary shooters in a lot of situations. I thought the Panasonic Varicam LT had a slow boot-up time of around 20 seconds, but the MAVO is actually worse. Every now and then I encountered a problem when I booted up the camera and then I couldn’t get it to do anything. None of the buttons would work and I had to hold down the power button for an extended period of time to get it to reboot. This is not something I expect to happen with a professional digital cinema camera. The camera has preset white balance values that range from 2600K up to 7000K. These preset values go up or down in 100K increments. Despite having so many preset white balance options, there is only one user preset where you can store your own white balance. The white balance and the color temperature are tuned by directly adjusting RGB channels of the sensor to change the original RAW data, rather than applying a digital LUT. Although you can modify the white balance of the RAW data or change color temperature during post-processing, all the modifications are based on the data you have shot. Doing a manual white balance on the MAVO isn’t a particularly quick process. You need to go into the Menu and choose Configuration, then LiveView, then Custom White Balance. I would have liked to have seen at least three user presets for white balance made available on the MAVO. The camera also has no CC adjustment so you can’t add or subtract green or magenta. 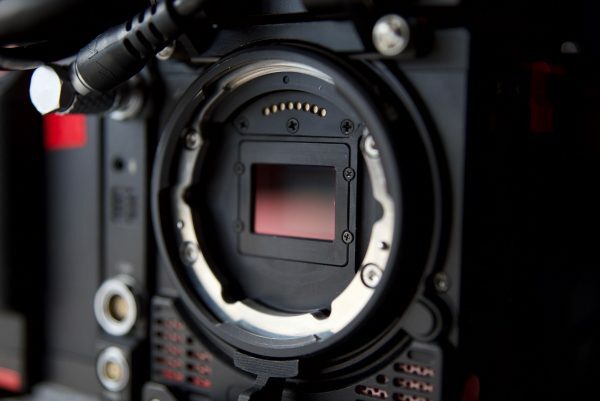 This is something that can be found on so many of today’s digital cinema cameras. In a nice touch, you can bring up a white/grey card checker in the menu system so you can compare them directly against a white/grey card that you may have. This is a handy way of making sure you are getting your white balance settings correct. You can bring up a waveform on the display. The waveform is displayed across the bottom of the screen and indicates the brightness of images over the horizontal direction. By default, the waveform shows the LUT KC-Neutral. The waveform will change according to whatever LUT is being used. You can also change the waveform to display RAW RGB. 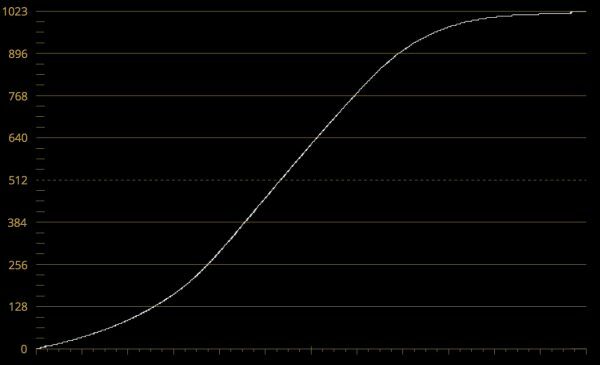 When this is set the waveform shows the distribution based on the RAW data. For example, if you have the waveform set to Post RGB then if your waveform goes over 100% you will still probably not be clipping your image (as the MAVO only records in KineLog. 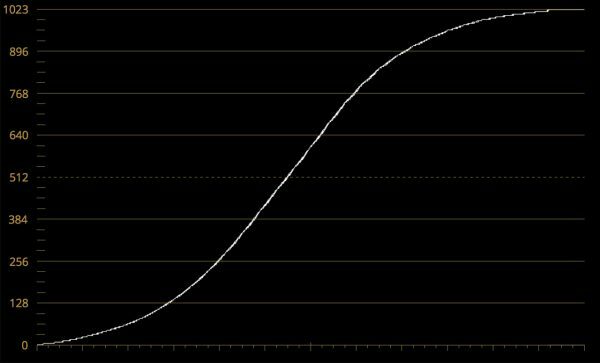 If you set the waveform to RAW RGB then if the information is exceeding 100% then you will definitely be clipping your image. Kinefinity recommends that the main image should exceed over 50% to avoid noise. The waveform has two key line marking on it. The first shows where an 18% Grey card should be exposed correctly and the other shows where 90% should land on a white card. The zebras on the MAVO are a very easy way to show overexposed areas in the image. On the MAVO, the zebra calculation is based on RAW data. This means that when your zebras are set to 90% if you see zebras appear your image is getting close to being overexposed. 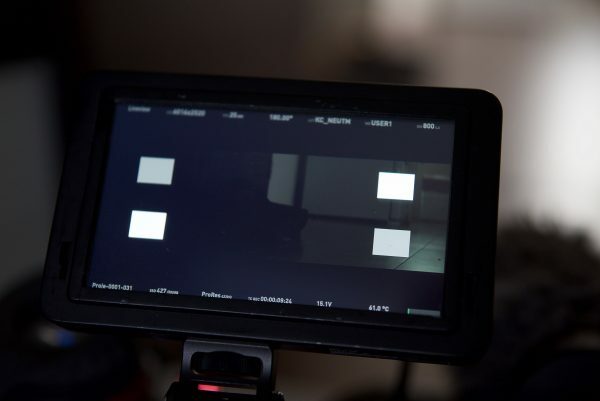 The camera doesn’t have any built-in ND filters so you have to either use a matte box and filters or a variable ND. 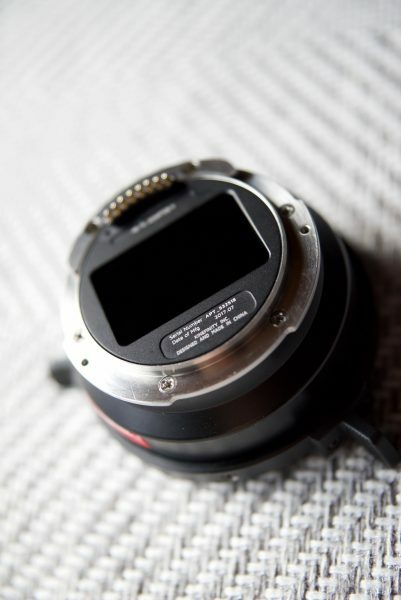 If you do use Canon EF lenses you can get the optional EF mounting adapters with electronic ND(e-ND). The EF Mounting adapter with Built-in Electronic ND (e-ND) employs a high-precision hybrid of liquid crystal material, optics, and electronic technology. It covers a wide range from 0.6 to 3.3 (2 stops to 10 stops). This is extremely handy having ND built-into the mount. Unfortunately, Kinefinity didn’t supply the EF Mounting adapter with Built-in Electronic ND so I wasn’t able to test it. 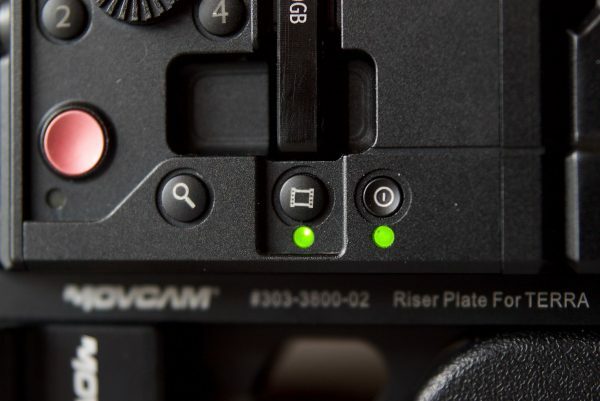 The SideGrip gives you the same menu controls and functions that are available on the operators’ side of the camera. It is also where the BP-U style battery goes to power the camera. The SideGrip doesn’t rotate or move. The unfortunate aspect of the SideGrip is that if you are powering the camera off a V-lock battery from the KineBack-W, you still need to use a BP-U style battery to be able to power it. In my opinion, this is a design flaw. If I’m going to power the camera off a larger V-lock battery, I want that battery to power everything on the camera. Since posting the review, Carl from ProAV has stated in the Kinefinity Facebook group that this is not the case for their Terra4K & is sure that it is also the case for the MAVO. “If you have the camera with sidegrip and Kineback connected, you can power the whole camera and have full functionality on every component when using just one V-lock battery. 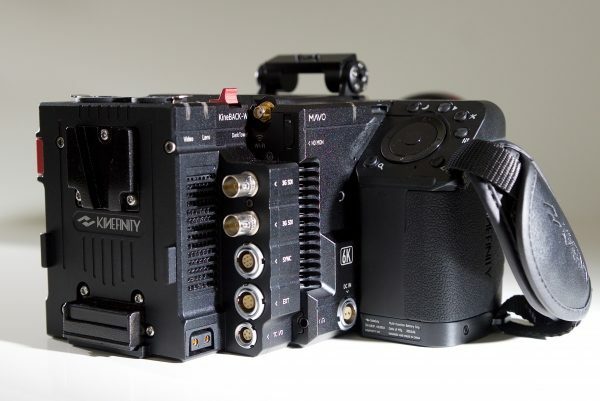 Or you can power with a battery in the grip and have everything except power out of the D-Tap ports.” We have inquired with Kinefinity to confirm whether this was addressed in a later firmware update or not. As far as I am aware the firmware I was running at the time was the most current available. I can only review what I am given and make assessments based on that particular camera. Again this was something I raised with Kinefinity in person and at no time did they mention to me that it should work without having to have a battery inside the grip. The SideGrip controls are nicely placed out, but it’s not designed very ergonomically, and it’s not nearly as comfortable to hold onto as offerings from Sony, Canon, and Panasonic which are contoured to the hand. This is probably due to the fact that it is quite square to house the BP-U type battery. 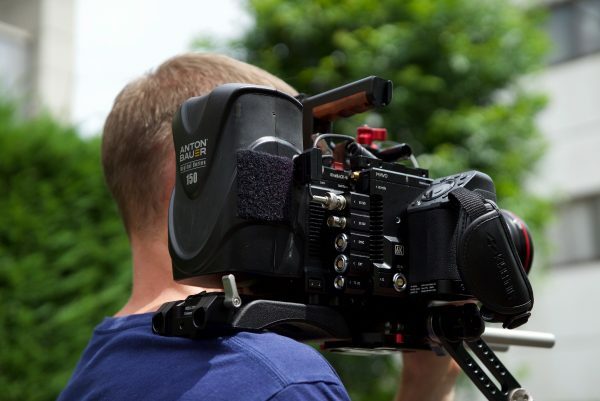 It is also mounted directly onto the body and does not use a rosette and cable meaning you can’t relocate the handgrip when using the camera on a shoulder rig. The other thing I don’t like about the SideGrip is that there is no physical battery hatch on the bottom of it. If you don’t have a battery inside the grip then it’s just exposed to the elements. The KineBack-W ($1,190 USD) really is an optional accessory that you need to make the MAVO a functional camera. Without the KineBack-W, you can’t record any real professional audio, you don’t have any SDI outputs, and you don’t have any timecode in/out. The KineBack-W adds dual 3G-SDI monitoring outputs, dual XLR ports for Phantom-powered 48V mics, timecode input and output, SYNC, DC Power outputs, and an all-metal V-mount battery plate with dual D-Tap ports. Removing the KineBack-W is not something can be done easily or quickly. So let’s have a closer look at what it offers. 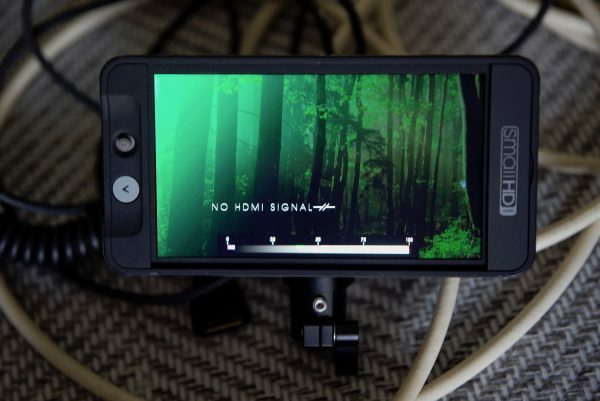 works with HD digital port and KineMON port simultaneously: this allows for either display with parameters or a clean display (I did not find this to be the case). The monitoring signal in its default configuration is set as [email protected] [email protected] can be applied only when you are sure that your SDI monitor/EVF can support 3G-SDI. The KineBack-W has a recording module which supports dual balanced MIC-IN with or without +48V phantom-power. The XLR ports face straight upwards just like on a Blackmagic Design URSA Mini, which I’m not a fan of. I find these ports difficult to access, especially when the camera is raised high on a tripod. As far as audio recording goes there are some things you need to be aware of. In the main menu, there is an audio section you can go to. Here you can choose to turn the two XLR inputs on the KineBack-W on. This audio menu can also be accessed by double pressing on the audio icon on the side of the camera. You can choose to enable phantom power, but there doesn’t seem to be any way of assigning phantom power to just one of the two channels. There is no Line Level function available, it is only Mic Level. You can also set the individual levels for the two microphones in the menu and you have the choice of choosing to do it for Channel 1 or Channel 2, or for both Channel 1 and Channel 2. If you select Channel 1 and 2, any adjustment you make will be made to both of the mics. You can also adjust the mic level by pressing a button on the side of the camera and then using the scroll wheel to make changes. This is fine, but the catch is, if you are using two different microphones they usually aren’t going to be at the same levels. If you have the level adjustment set to Channel 1 and Channel 2 in the menu this is going to be a problem. Now if you go back into the menu and choose Channel 1, then you can only adjust Channel 1 from the side of the camera. If you want to then adjust Channel 2 you need to go back into the menu and change the setting to Channel 2. As far as headphone monitoring goes, you can adjust the headphone volume in the Audio Menu, but there are no other controls. You can’t choose to just listen to Channel 1 or just Channel 2. Channel 1 goes to one ear and Channel 2 goes to the other. Even if you using just one channel of audio, it still only comes through one side of your headphones. One of the other big drawbacks with the audio is you can’t set any of the channels to auto. That means if you are running an on-camera microphone you have to continually adjust the levels. When I was filming at a drag racing event this was a pain in the backside. As the audio conditions go from quiet to ridiculously loud I ended up with many instances where I had unusable audio. There are also no built-in limiters or option to record a safety track. While the pre-amps sound pretty good and the audio quality is good, in reality, the audio recording and control options on the MAVO (using the KineBack-W) are quite limiting. If you are someone who needs to record your own sound in the camera, it’s not the easiest system to deal with. Cameras such as the MAVO (just like a RED or an ALEXA) aren’t really designed for proper audio recording, or for making adjustments in a hurry. If one of your requirements for a camera is easy to use and control audio, then the MAVO certainly isn’t for you. The V-mount battery plate has been designed to match the shape of KineBack-W. The battery plate also has dual D-Tap ports for powering other accessories. It’s important to note that the D-Tap outputs are connected directly to the V-mount battery, so the output voltage varies from 11V to 17V, instead of being a regulated 12V. I did run into a problem when trying to mount a V-lock battery on the back of the KineBack-W. I tried putting on two different versions of the Hawkwoods Mini V-Lok Li-Ion Batteries as they are a nice match for the MAVO, but neither would clip in properly on the V-mount battery plate. I then tried an Anton Bauer CINE 150 battery and that fitted on properly. I have never encountered a problem before with not having certain batteries fitting on a standard V-mount battery plate. I also ran into problems where having used the camera with a V-lock battery I would turn the camera off and then try and turn it on again and it wouldn’t power up. The only way to rectify this was to take the battery off and put it back on again. If you want to use Anton-Bauer (gold mount) broadcast battery, a V-mount to Anton-Bauer Plate Adapter is available. The KineBACK-W also adds support for timecode input and output. This allows you to output timecode to other equipment such as sound recorders. The KineBack-W can also use timecode from an external timecode generator if you use the MAVO as a timecode slave. The timecode port is a 5-pin MOCO socket, but it can be adapted to become a BNC port or timecode port of other timecode generators if you use the appropriate Kine Timecode Cords. The KineBack-W features two [email protected] DC outputs, which can be used to power external monitors, wireless transmitters, and other accessories. The power output port is a 4-pin MOCO socket. For a multi-camera sync system (more than two), all TERRA cameras need to be equipped with KineBACK. One KineSYNC device can sync up to eight MAVO cameras (one master camera and seven slave cameras). Without the KineBack-W audio recording is extremely limited. The camera body only has an in-camera microphone or the ability to connect up a 3.5mm external microphone. The in-camera microphone is pretty horrible and you can’t really use it for anything other than a scratch audio track. Note: Frame Rate can be adjusted as 2~MAX fps, step accuracy of 0.001fps. 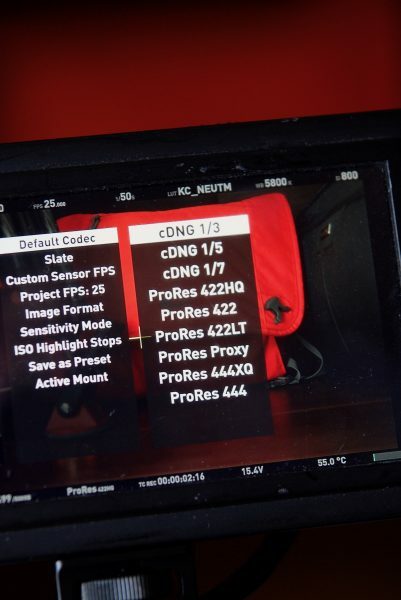 Note: ProRes444 and 444XQ do not apply for all resolution and fps. As you can see 192fps in the maximum the camera can do in 2K HD Wide 1920×800, but that can only be done in the 16mm sensor crop mode. In 6K (6016×3172) the MAVO can do up to 50fps. In 4K wide (4096×1720) it can do 92fps, but only in the M4/3 mode. 5K (5120 x 2160) at 74fps offers a nice balance between resolution and higher frame rates. This still allows you to use the S35 sensor mode (no sensor crop), and I found this is the cameras sweet spot in terms of resolution and frame rates. The 50fps in the 6K (6016×3172) S35 sensor mode is gorgeous. The image is super clean and sharp at 800 ISO. Even if you crop in 300% the picture is still stunning. The 16mm mode at the base ISO of 800 does show some noise, but it’s not too bad. The images, however, are quite soft. At 192fps in the 2K HD wide setting, you shouldn’t expect miracles. The images can look ok in the right situation, but I’d use this mode with caution. You also need to take into account that it’s very hard to shoot anything wide at high frame rates in the 16mm mode because of the massive crop factor. I wouldn’t want to shoot in this mode at any ISO over 800. In the M 4/3 sensor mode, the 4K Wide 4096×1720 mode allows you to shoot up to 92fps. This provided fairly decent results and I would be comfortable using this. It does have slightly more noise than in the S35 sensor mode, but as long as you stick to the base ISO or lower it’s not bad. Realistically, if you stick to the S35 and M4/3 modes you can get pretty good results at higher frame rates. The ability to be able to shoot at up to 74fps in 5K (5120×2160) and 6ofps in 6K Wide (6016×2520) is impressive for a camera at this price point. Something that shouldn’t be overlooked is the MAVO’s ability to still capture audio regardless of what frame rate you are running. On most cameras, audio recording is disabled at higher rates, but as the MAVO records it’s audio as separate clips in with the file, you always have audio being recorded. This is very handy and something I took full advantage of when shooting drag racing. 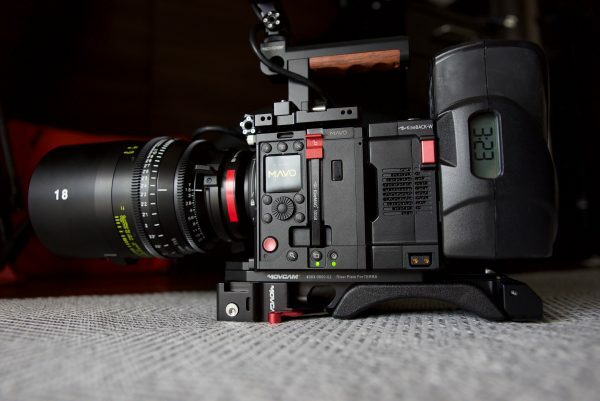 The MAVO has a host of anamorphic recording options including 6K Open Gate (6016 x 4160), 4:3 Anamorphic (5376 x 4160) and 6:5 Anamorphic (4864 x 4160). It’s pretty amazing to see 6K Open Gate (6016 x 4160) on a camera at this price point. 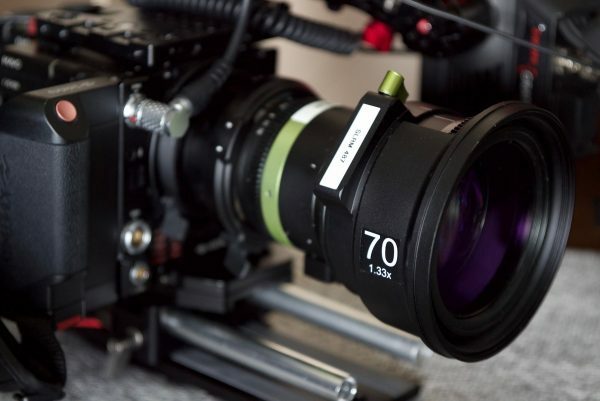 What you do need to be aware of is anamorphic lenses are expensive to both rent and buy. For me, image quality and usability are the two most important factors I look for in a camera. All the specifications mean absolutely nothing if the camera isn’t easy to use and doesn’t produce nice imagery. The MAVO produces really accurate colors and it is very easy to get nice imagery with the camera without having to do much in post (unless you are shooting RAW). The ProRes imagery is really, really nice and I was very happy with the results I got from the camera. The MAVO’s color science is really nice. While the camera still maintains a rather unique look, I think Kinefinity has come a long way with their color science. The camera produces very accurate colors straight out of the box and the skin tones look very natural and pleasing to the eye. Above you can see a couple of quick skin tone tests I did where all I have done is add the KC_NEUTM LUT straight to the image. I haven’t adjusted anything in post. The skin tones have a very slight push towards magenta but in a pleasing way. Of course what skin tones are going to look like is determined by not only the cameras sensor and color science, but also by the lens and lighting conditions. Skin tones can also be massively manipulated in post and taken in any direction you wish. The colors the camera produces are far more accurate then previous Kinefinity cameras I have seen and used. Even though the camera isn’t really designed to be used for turning around material quickly, it’s nice to know you can just add a LUT to your footage and get a nice looking image straight away. I shot pure white on a color checker chart with the camera set at 5600K and a Luxli Timpani 1×1 RGBAW light was also set to output 5600K. I wanted to see if the MAVO had a color push in any direction. As you can see from the above scopes, it is fairly neutral. There is a tiny push towards magenta, but it is very, very small. 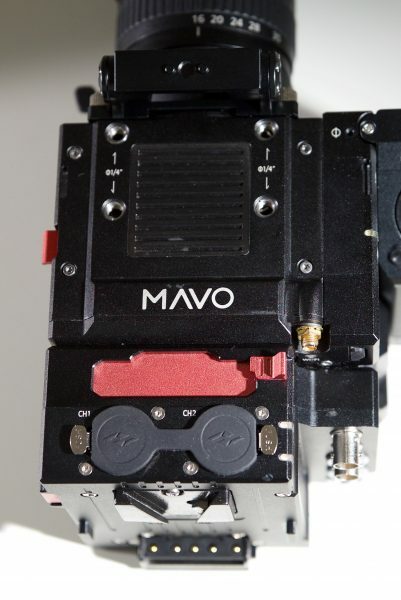 The MAVO does suffer from some rolling shutter problems like most other CMOS sensor cameras. In saying that, it’s not horrible and I didn’t find it interfered with anything I was shooting in a negative way. Above you can see a frame where I was panning very fast following a drag car. You can see the effect that the rolling shutter is having on the vertical lines. You can adjust the ISO values from 400 to 32,000 ISO. The MAVO can be used in both ISO and EI modes. The default ISO is 800. The highlight level (Highlight, that is 18% gray to ADC Clip) is 4.3 stops. 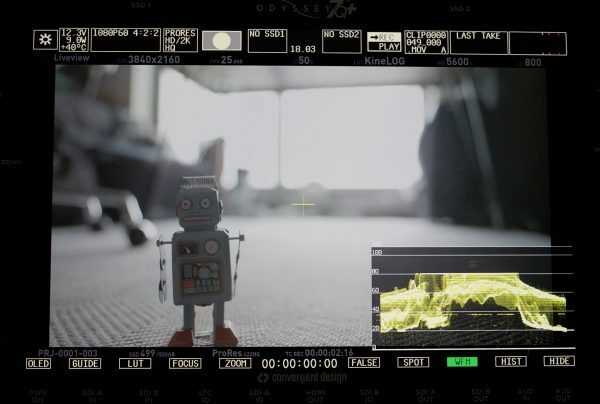 Setting the ISO below 2560, does not affect latitude, while according to Kinefinity, ISO settings higher than 2560 degrade the image due to noise. If you set the MAVO to EI Mode, changing the nominal EI value affects the Highlight and shadow stops. The image brightness is adjusted by digital gain while the CMOS image sensors analog gain remains unchanged. As the name suggests highlight stops is a way of assigning more stops to the highlights and having less in the shadows to help reduce unwanted noise. Kinefinity recommends that if you want to retain highlight details, you should set the highlight stops to at least 4.0. By changing highlight stops you aren’t changing the amount of dynamic range being captured, you are just changing where those stops of dynamic range are being allocated. Highlight stops can only be adjusted when the camera is in ISO mode. 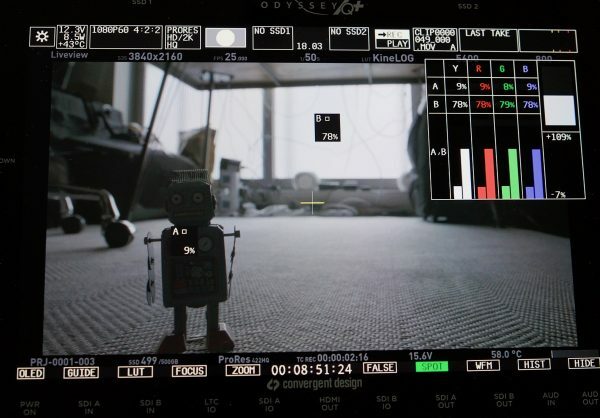 Kinefinity cameras have never been known as low light cameras, but the company now claims that by using advanced CMOS sensor process technology, the MAVO has a lower noise level. The noise level is said to be half of that of the TERRA 4K. Even though the MAVO has a base ISO of 800, they claim that the noise still remains low at 1600, 2560, and 3200. So how much noise is there? Well, I did some tests with the camera in 6K, UHD and HD resolutions to find out. 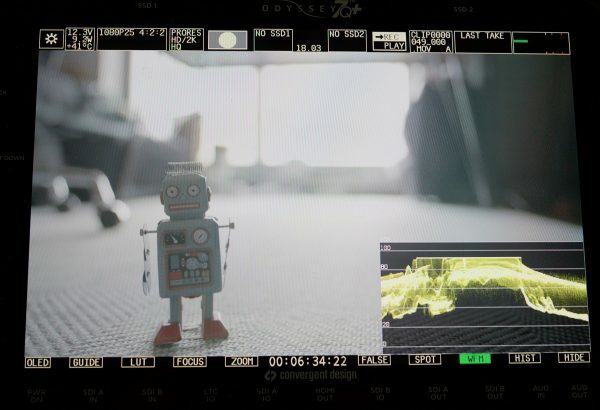 I set up a small scene and illuminated a small robot so he was at 50IRE as Kinefinity recommends that the main image should exceed over 50% to avoid noise. I kept this 50 IRE value consistent on the robot when I changed the ISO values by stopping down the lens. The darkest points in my background were all giving me readings above 0% so nothing was being hard clipped in the shadows. 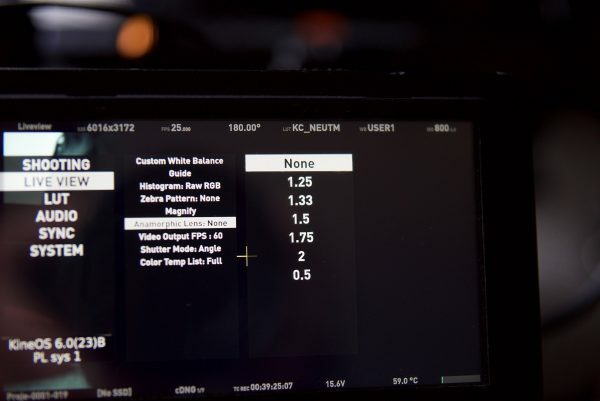 One thing to note before looking at these ISO tests is that Kinefinity has since released a new firmware which addresses the color shift towards green when the camera ISO is set higher than 2560. Unfortunately, I wasn’t able to redo the tests with the updated firmware. At 6K I found that the images looked pretty good up to about 1600/2560 ISO. Once you went above 2560 ISO there was a noticeable color shift towards green. The push towards green gets worse as you go higher up in ISO values. This looks like a sensor issue that hasn’t been fully corrected by the camera’s processing. 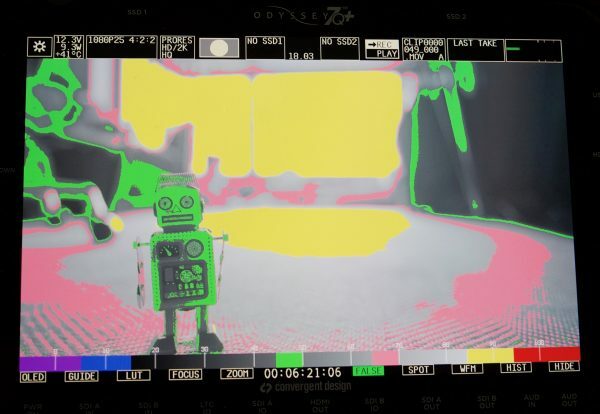 While it’s not unusual to have color shifts throughout the dynamic range of a sensor, you would hope it would be better corrected by the debayer processing, whether it’s in camera or in post. In UHD the results were marginally better than those that I got in 6K, but not by a big margin. Again, just like in 6K, once you went above 2560 ISO there was a noticeable color shift towards green. I personally wouldn’t want to shoot at anything over 1600 ISO with this camera in resolutions of UHD and above. In HD (M 4/3) the results were better than in both 6K and UHD. From my tests, I thought you could probably push the camera to 3200 ISO without any problems. 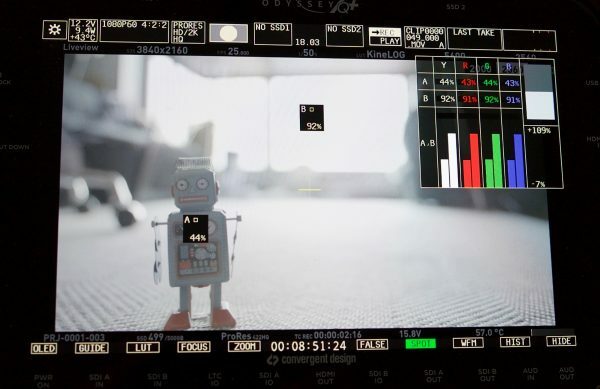 The good news about shooting in HD in the M 4/3 sensor size is that you don’t get that nasty push towards green at higher ISO values as you do shooting in 6K or UHD. The MAVO is far from being a low light beast, but it still performs well at the majority of ISO values I would personally use. 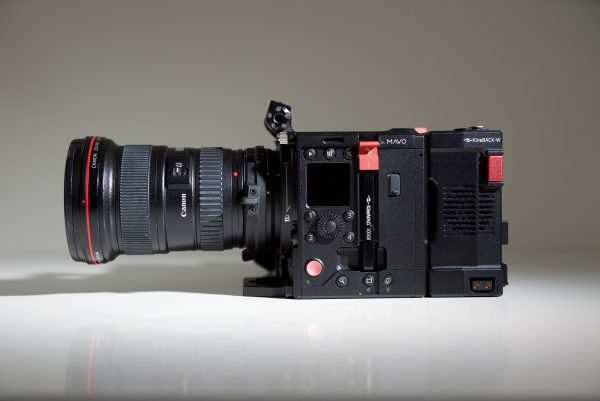 If you are looking for a digital cinema camera that looks great at 5000 ISO, then this isn’t it. If you stick to 1600/2560 ISO and below I think you will be very happy with the results. If you want to shoot RAW then you have to be prepared to not only deal with the huge amounts of data, but also the post-processing that needs to be done. Currently, the camera doesn’t have KineRAW 2.0 as I mentioned earlier, and if you want to shoot RAW, then you can only do it in Cinema DNG. 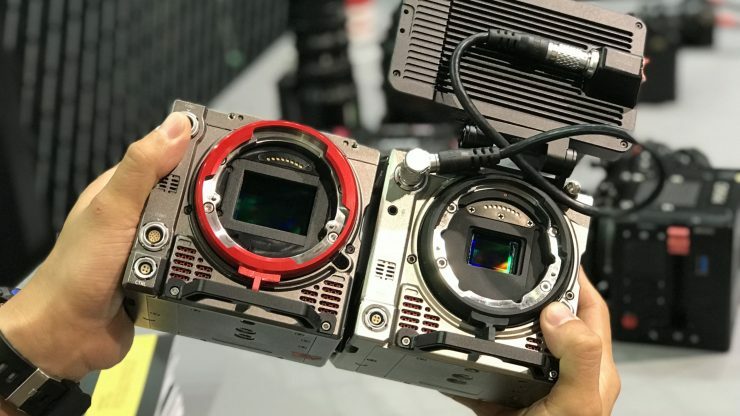 I did get a chance to talk to Kinefinity at BIRTV in Beijing last month and they all but confirmed that ProRes RAW will be coming to the MAVO and MAVO LF once other NLEs and color grading software support it. Whether or not they also add support for Blackmagic RAW since it’s recent release at IBC will be another interesting question to find out. As far as competition goes, that is a tricky one. 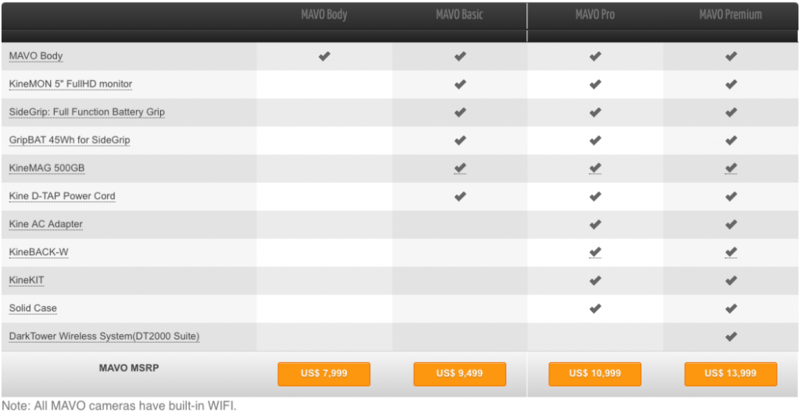 If you are comparing the MAVO based just on specifications there really aren’t any direct competitors at its price point. At $7,999 USD (body only), or $9,499 (basic kit without the KineBACK-W) the MAVO certainly offers good value for money. So what else can you get these days for under $9,500 USD that could potentially be considered a competitor? 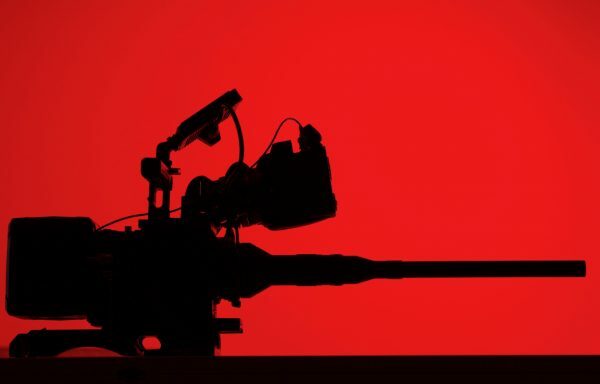 All of these cameras have their strengths and weaknesses and there are so many factors you need to consider when picking the right camera for the type of work you do. The MAVO has been designed to be compatible with TERRA accessories such as the KineBACK-W which provides SDI monitoring, XLR 48V audio, V-mount plate, regulated DC output, timecode sync and 3D sync in one module. 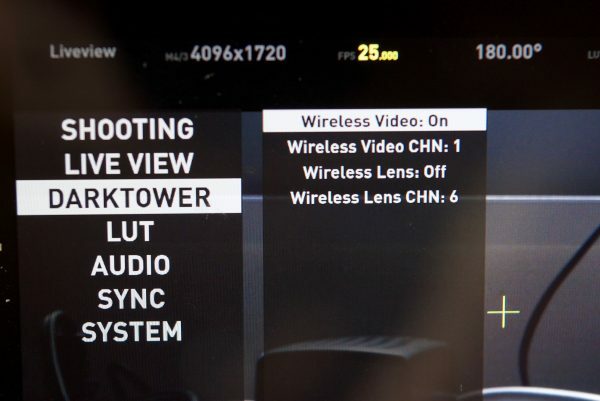 It also supports the Darktower platform that allows for wireless video and lens control. 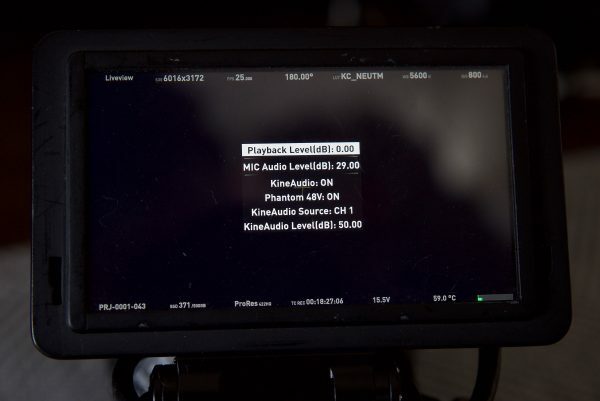 For monitoring, Kinefinity has the KineMON, a full HD 5″ monitor that is powered and feeds video from only one cable. 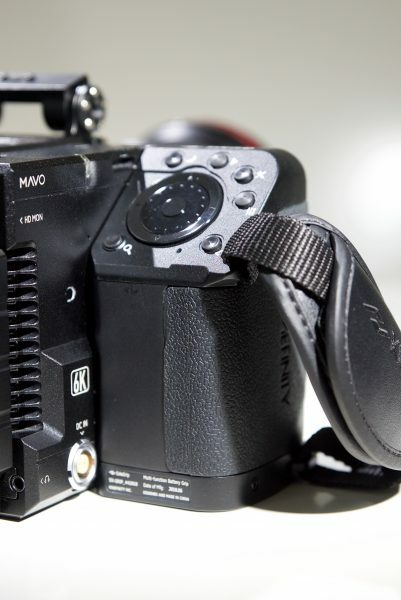 There is also a SideGrip that provides control and power for the MAVO using a GripBAT 45Wh (BP-U30 compatible) battery, which Kinefinity claims provides more than one hour of usage. 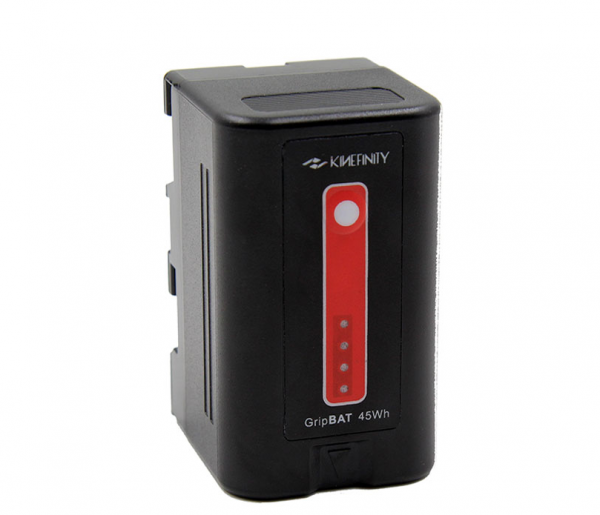 There is also a KineBAT 120Wh, a compact V-mount battery to provide additional run times. The KineKIT-TERRA from Movcam is a complete shoulder mounting kit with a baseplate, top plate, handle, hand grip with stop/start trigger and much more. This kit is not bad, but you still need to use a reasonably heavy battery along with the KineBack-W to get a reasonable balance. 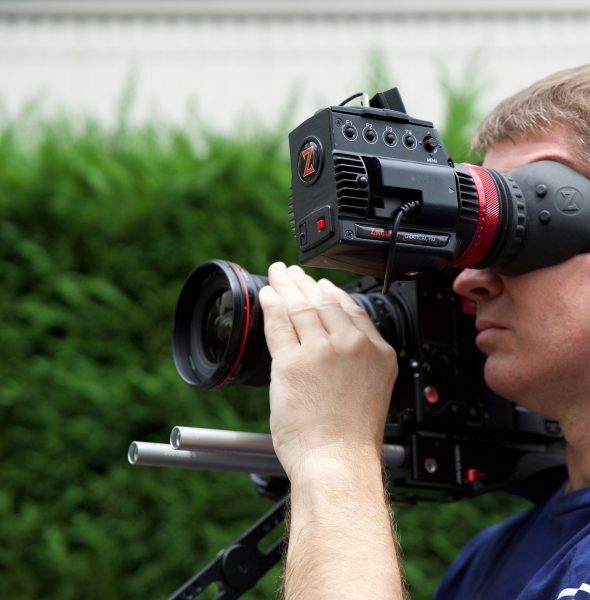 You also need a third-party EVF or a very bright external monitor. The other problem with this setup is that you can’t easily control the camera, as the SideGrip can’t be relocated from the camera body and if you are using a Canon EF lens the only way you can control the aperture is from the side dial or the dial on the SideGrip. Both of these are very hard to reach when using the camera on your shoulder. MAVO LF shipping date: October 2018. The biggest stumbling block for owning a Kinefinity camera is still when it comes to after sales service and support. If you buy one of their cameras in China or in Europe there is someone you can turn to for information and support. Unfortunately, in many other places in the world, including the US, there is no easy way of getting repairs done or receiving after sales service. For many potential owners, this is probably the primary reason that they shy away from buying a Kinefinity camera. This really is a shame, because I think the company makes good cameras that are a nice alternative to what’s on offer from other manufacturers. 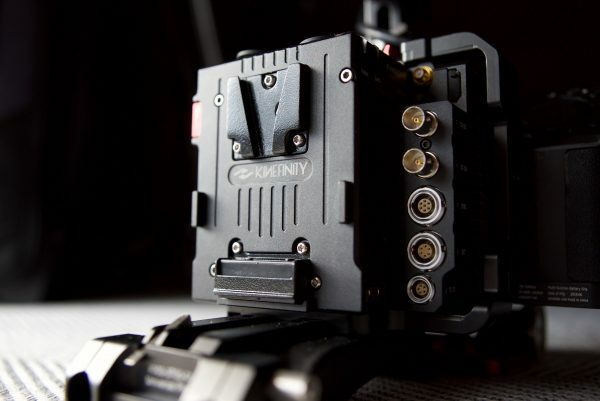 For many owners and prospective users, the Kinefinity Facebook group is one of the quickest ways to have your questions or issues about the camera answered. 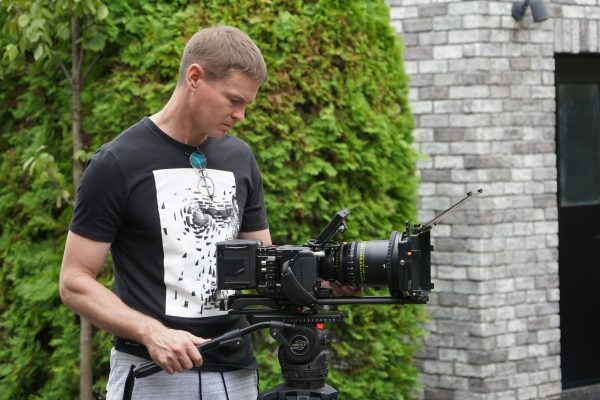 Kinefinity’s own Jihua Zheng is frequently posting updates and answerings questions in the Facebook group. The other two problems you may well encounter are resale value and clients having no knowledge about the camera. In some cases, clients will either request a particular type of camera or want to know what you are shooting on. 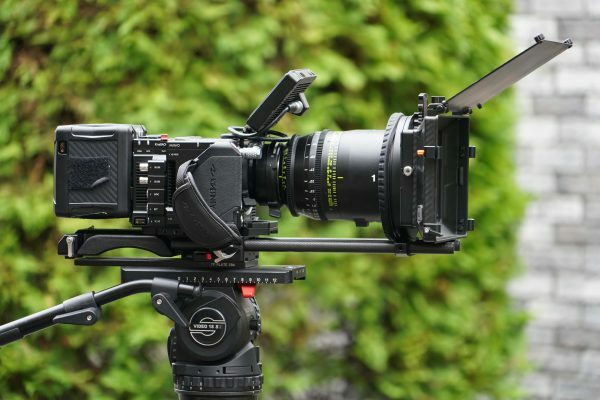 In the case of owning a Kinefinity, you may well be met with some resistance because the client has never heard of that camera before and could be reluctant to want to use it. These are real-world situations that you have to think about carefully before investing in a Kinefinity camera. So would I buy one? That’s a hard question to answer. It really depends on the type of work you do and the clients you have. 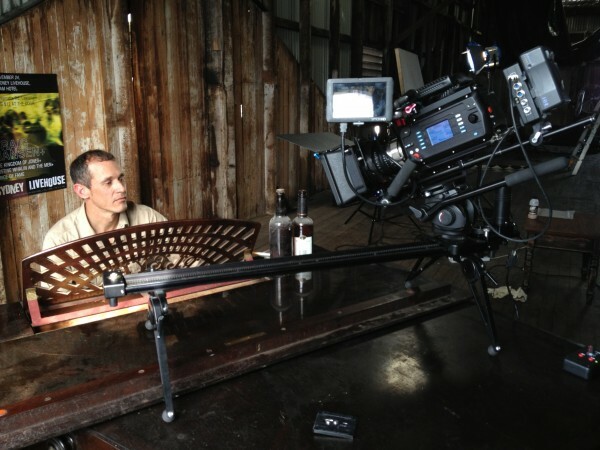 If you are an independent filmmaker or creating your own content then the Kinefinity makes for a compelling option. If you are working for clients or production houses they may not want to hire someone who has a camera they are not familiar with. Is this a stereotype, absolutely, but it’s also the reality. Maybe other MAVO cameras are better, but the one I was reviewing was not in my opinion, what I would call reliable. It’s not like I was having continual problems with the camera, but even if a problem happens once every 20 times you boot up the camera, that’s once too often. Serious professionals need 100% reliability. 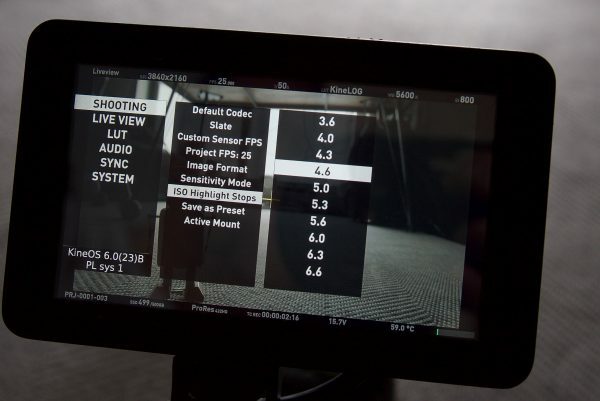 Kinefinity certainly still have some work to do to achieve this but it is good to see that they are continually releasing firmware updates and fixes for the camera. Is it better to wait and get the MAVO LF? If it was me I would probably spend the extra money and get the MAVO LF. The MAVO LF has a Dual Native ISO of both 800 and 5120 and it is far superior in terms of noise levels (particularly above 3200 ISO) than the MAVO. You also get a larger full-frame sensor that gives you more creative options. 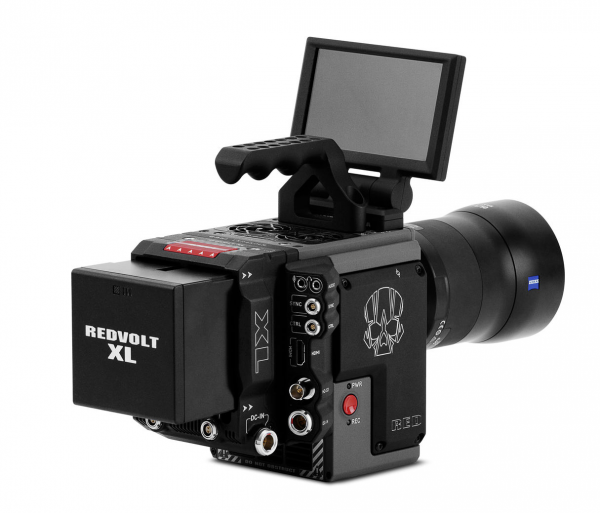 Kinefinity has made an impressive camera given how small their company is. Making a camera, let alone a good one is no easy task. Many have tried and failed, but Kinefinity has continued to improve over the years. The MAVO is an interesting camera that has a lot of potentials. Potential being the keyword. I have a love-hate relationship with this camera. Literally one minute I love it and the next minute something makes me curse. In saying that there is a lot to like about this camera. The images it produces are really nice and its small and compact size make it easy to travel with. 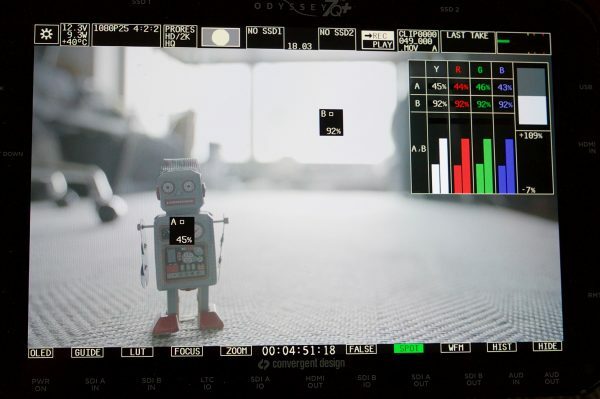 The menu and operation systems could be better and more streamlined, but Kinefinity has continually improved this facet of their cameras over the years. The camera definitely has its issues and you really need to be very aware of them if you plan on purchasing a MAVO. Reliability is my biggest concern. I had far too many instances of the camera freezing up once it was turned on and having to take batteries off and then put them back on again. For me personally (and probably most other people) these are problems you shouldn’t have to deal with on a digital cinema camera at this price point. Do other MAVO cameras that have shipped have any reliability issues, I have no idea. I can only comment on my own personal experiences with the camera I was using. I think Kinefinity has a lot of work still to do and I know they are working hard on firmware updates that will hopefully resolve some of these niggling issues. From my time spent shooting with the camera, I got left with mixed feelings. The images are really nice and the camera certainly offers a lot of value for money, but I feel like Kinefinity has tried to do too much with the MAVO. I would have preferred to have seen them make just a good, solid 6K camera that didn’t have all the bells and whistles. It’s almost a case of trying to put too many eggs into one basket, and in the process, some get broken along the way. If I had any advice for Kinefinity, it would be to concentrate on the basics. Sort out reliability and ease of use, then move up from there. Some of these criticisms may sound harsh, but my job as a reviewer is to give you the cold hard facts and let you make an informed decision based on real-world truths and not marketing garble. The problem with buying any product from a small company is that it has to be better than what’s on offer from the big boys. You can’t just make a product that is the same, otherwise, nobody will buy it. 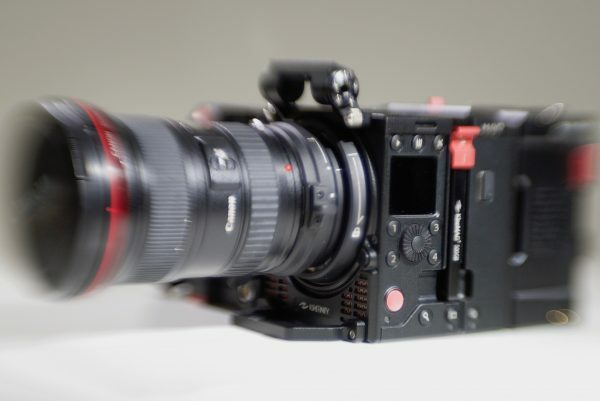 Kinefinity has positioned themselves as an alternative solution to more popular cameras on the market. Is their camera better? In some ways yes, but in other ways no. There’s absolutely no doubt that the camera can produce beautiful imagery, but is that enough? This is a question that keeps rolling around in my head. 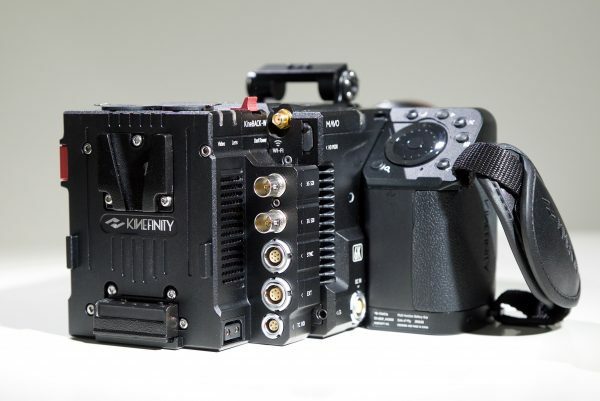 Owning a Kinefinity camera is a bit like having a custom kit car or building a Hackintosh. Performance isn’t the problem, it’s whether you can live with the quirks and idiosyncrasies of owning a niche product. UPDATE: Following the publishing of our review, Kinefinity CEO Jihua Zheng reached out with the following statement, which we’re publishing in order to give the review’s negative findings more context. For the record, Matt has made it clear that at no time was it communicated that this camera was not 100% representative of a final production model, and is looking forward to having a different experience when checking out the MAVO LF soon. We are still puzzled as to why a company would send out a camera that they now claim “Was just for functional verification and not for field usage” when they knew it was going to be used in the field for a full review. Matt: I mentioned all of these problems that I encountered in an hour-long conversation with Jihua at BIRTV in August. He was writing a lot of them down and taking notes. I even supplied all of the footage I shot with the camera to Kinefinity. Some of the new firmware that has been released is in direct response to problems I mentioned to Kinefinity. I raised every single issue I encountered with the camera with Kinifinity in person face to face well before this review was ever published. Again at no time during these discussions were the issues I was experiencing being blamed on the version of the camera I was using. I find it hard to believe that a company would be sending out a pre-production camera for a review when the MAVO has been shipping since June, and lots of them are already being used by paying customers. I can only comment on and review the camera I was provided with. We could have received an early version of the camera for review in late April, but we wanted to wait to get our hands on a full working production model and that is why we decided to hold off until mid to late July.